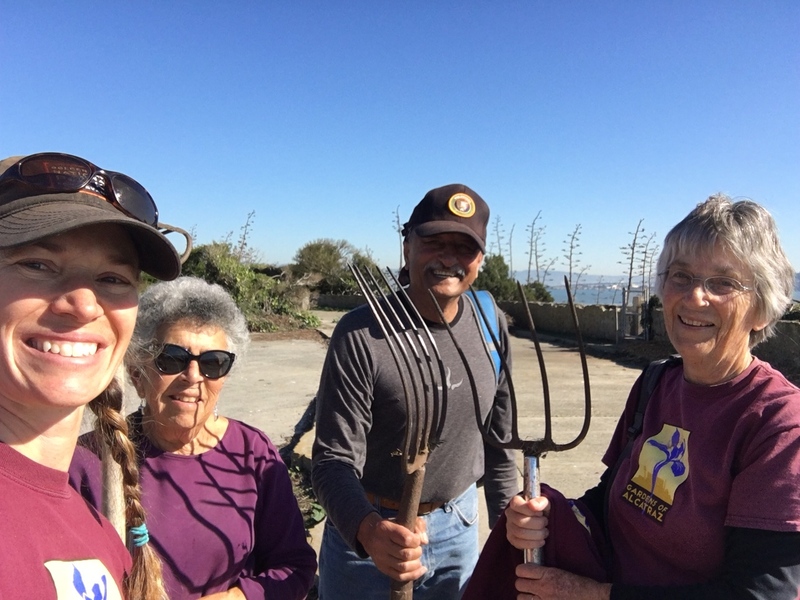 I was fortunate today to be invited to the monthly meeting of the Alameda Master Gardeners to teach them the ‘paperwork’ side of gardening. It’s a side of gardening that most visitors are not aware of, even if they are gardeners themselves. Section 110 and 106 of the Preservation Act set out broad responsibilities of Federal agencies and requires the agencies to take into account the effects of their undertakings on historic properties. 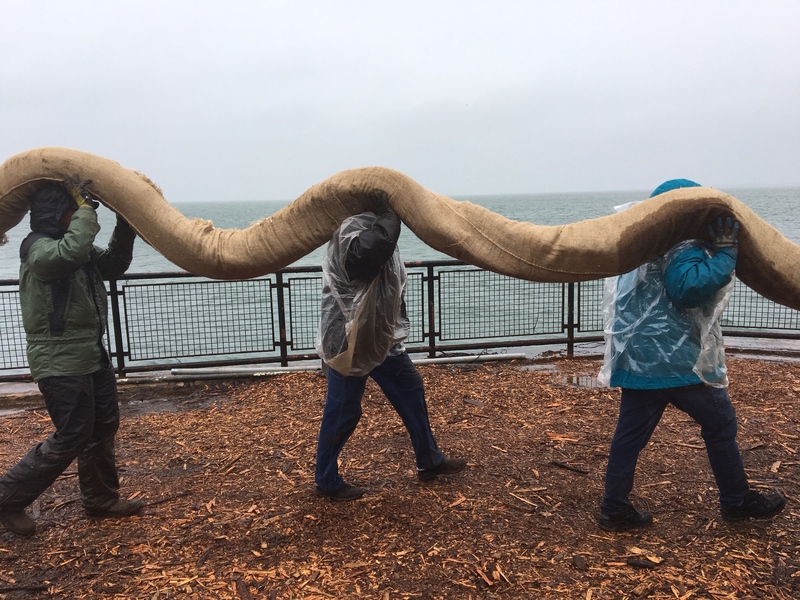 The Golden Gate National Recreation Area (GGNRA) does have its own team of a historic architect, historic landscape architect, archeologist and supporting staff to ensure that historic preservation is fully integrated into the ongoing programs within the Park. Beginning the class off, I introduced the concept of a cultural landscape – special places that reveal aspects of our country’s origins and development through their form and features, and they ways they were used. The special places include a wide range of landscapes – residential gardens, parks, scenic highways, battlefield and institutional grounds. There are 4 types of cultural landscapes – historic sites, historic designed landscapes, historic vernacular landscapes and ethnographic landscapes. 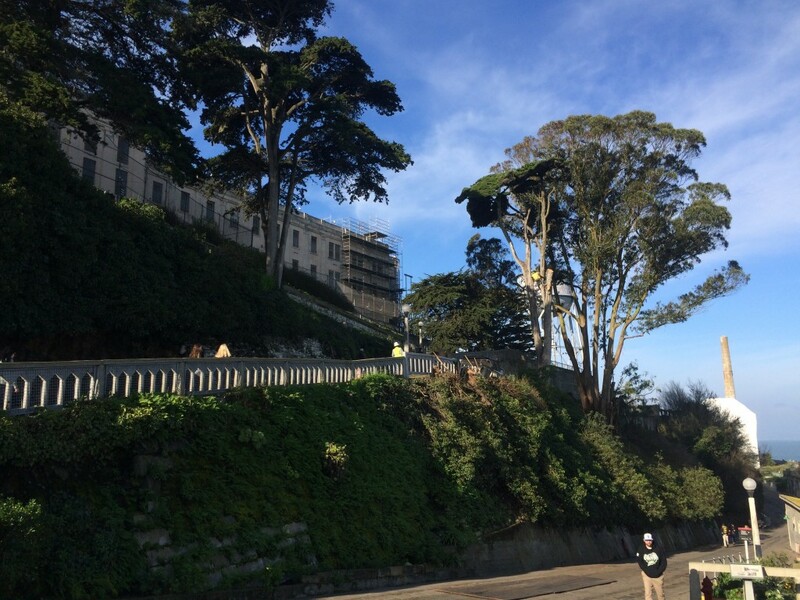 Alcatraz Island is a cultural landscape and the gardens fit in the historic vernacular landscape category. This is a landscape that has evolved through use of people whose activities shaped the landscape. The landscape now reflects the physical, biological and cultural character of the everyday lives of the residents. 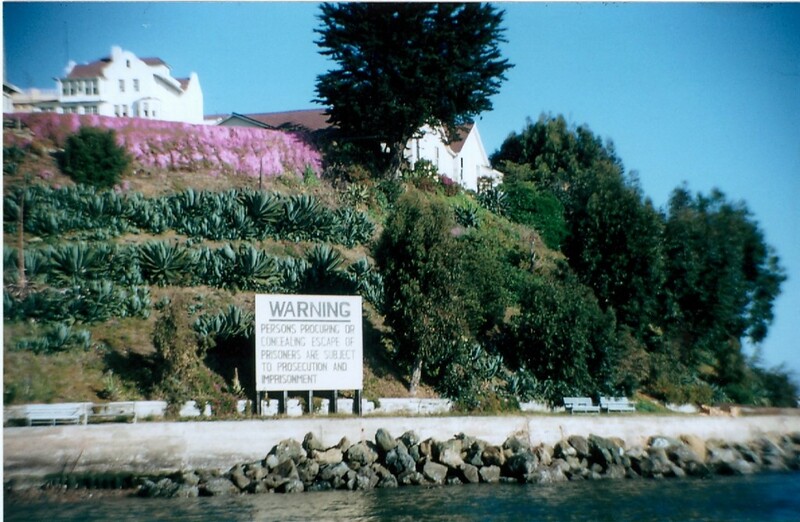 Alcatraz Island’s period of significance expands from 1847 to 1973. 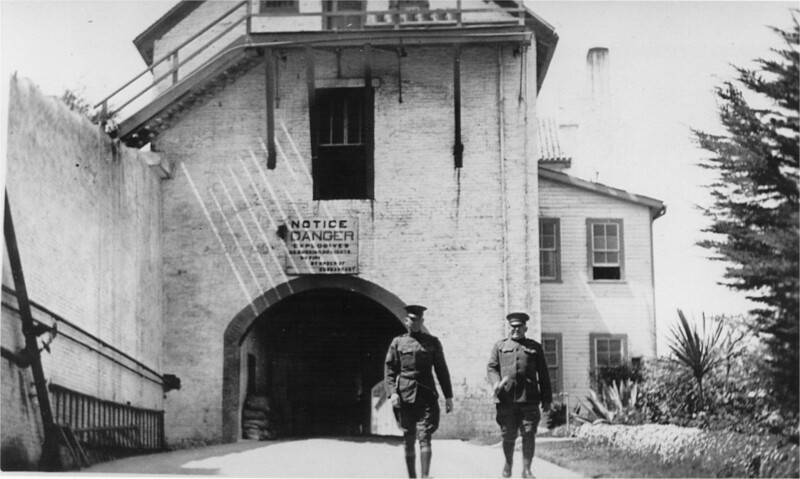 These years span the early exploration of the Bay, military fortification, including the construction of the first lighthouse on the west coast, the military prison, federal penitentiary and the early General Services Administration (GSA) caretaking, Native American Occupation and the beginning of the GSA while the island became part of the GGNRA. 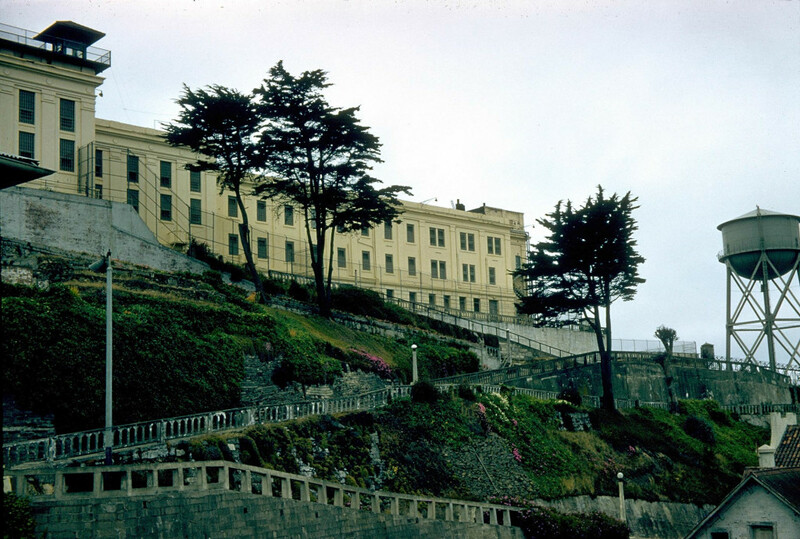 Alcatraz as a military fort. Perhaps this is where people started to doze off…but we weren’t quite done with terms and definitions. The Secretary of the Interior has Standards for Treatments, which is a series of concepts about maintaining, repairing, and replacing historic materials, as well as designing new additions or making alterations. The standards offer general design and technical recommendations to assist in applying the standards to a specific property. In a nerdy way, these standards are why I love my job. Using the guidelines, you can transform an overgrown historic garden into a cared for landscape once again. 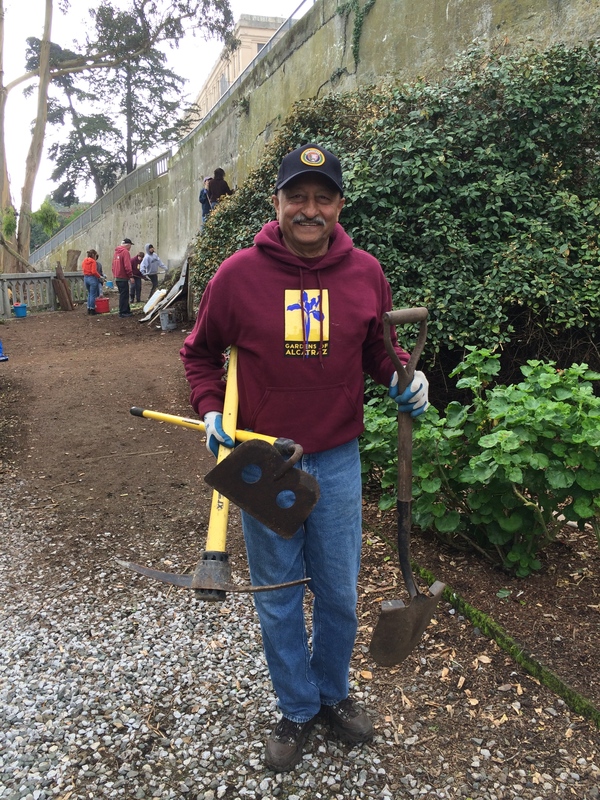 Rehabilitation fit our goal – to preserve and maintain the gardens created by those who lived on the island during its military and prison eras, and to interpret their history, horticulture, and cultural significance for visitors. The island still had over 200 species of plants, the majority of these were ornamental survivors from past residents, and plenty of remaining garden paths that gave the framework of the gardens. Looking for evidence of a garden in 2004. Photo by Bill Noble. With the rehabilitation treatment chosen, we had many considerations to take into account – the use of the gardens – historic, current, and proposed use for the future, archeological resources, the natural systems (nesting seabirds and we had no fresh water), interpretation of the gardens to visitors, accessibility and safety, not to mention the management and maintenance of the gardens. Beginning in 2005, a treatment plan was written up for each garden area that reflected the military and/or federal prison eras. Each plan contained historic photos, documented current existing conditions and described the future use. Working on one area per year, we finished the scope of our project in 2010. 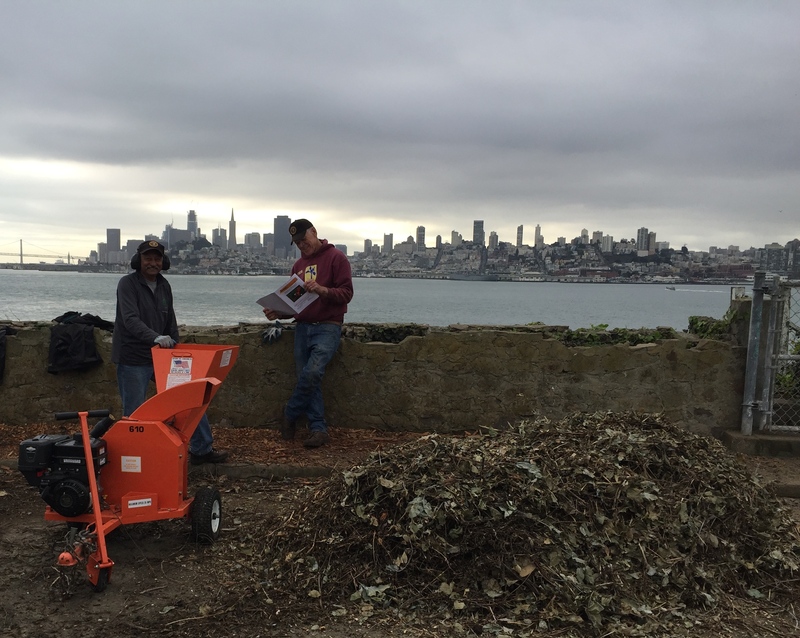 The bulk of our work was done prior to Alcatraz Island having a Cultural Landscape Report (CLR). Most historic sites have a report that has documented all of the contributing features of a landscape. However, the longer we waited, features of the gardens and the plants themselves were failing. We received permission to have a Cultural Landscape Inventory done, a much faster process, and with our treatment plans we moved forward. 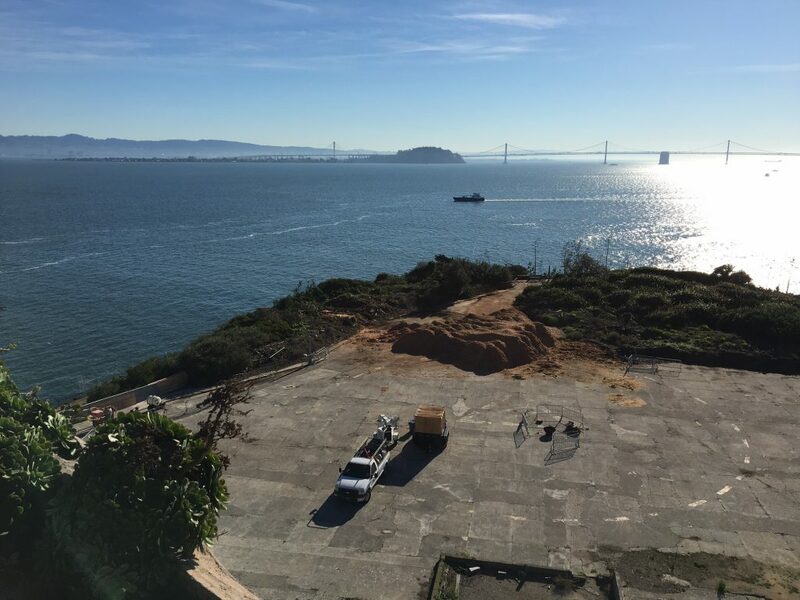 Now, with a CLR we are able to work on areas and while we still need our plans reviewed and approved, our plans fit into the overall plan for Alcatraz Island. Finishing off the lesson with photos of historic, before, and after photographs of the gardens, the terminology learnt earlier made sense (or at least I hoped). 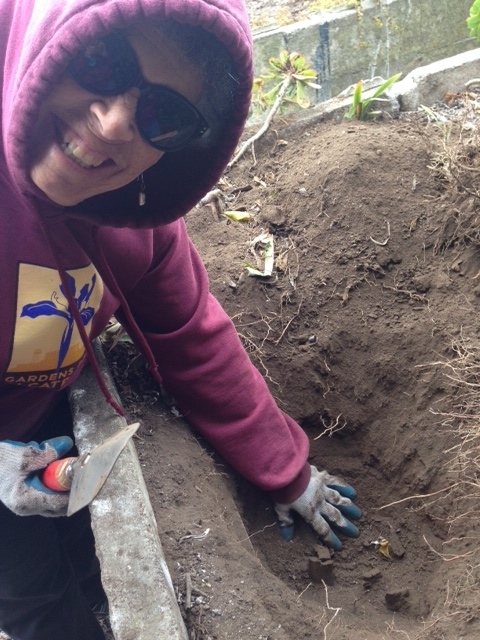 Just like compost is the best foundation for thriving plants, well made plans make the best foundation for gardens. 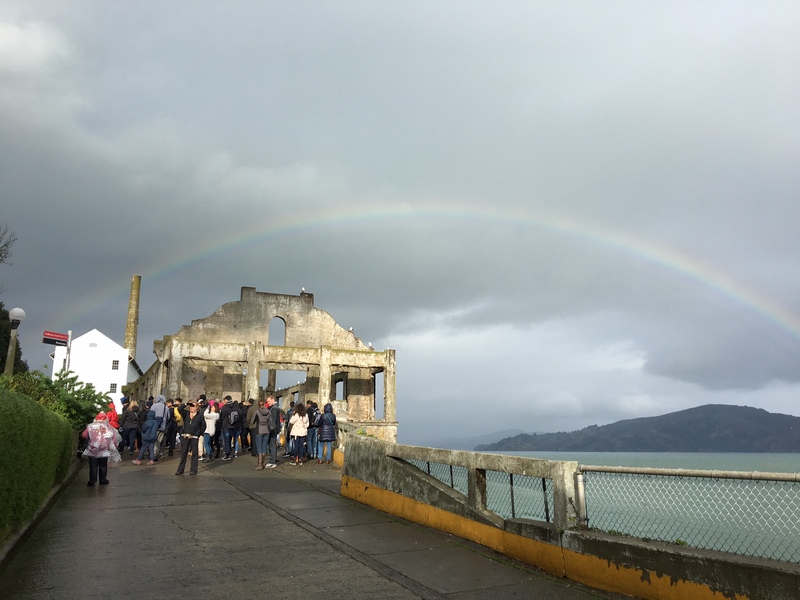 Afterwards, people came up to chat and many remarked that they had no idea there was so much history on Alcatraz. I think this quote from Richard Moe, president of the National Trust for Historic Preservation says it best – “History is typically conveyed through books or in a classroom, but history can also be conveyed through place”. Maybe next time just walking down the street, you’ll question why a row of trees was planted or why the fountain was placed where it was, or why a random granite block is in the sidewalk? The cultural landscape is everywhere around us, just waiting to be read. 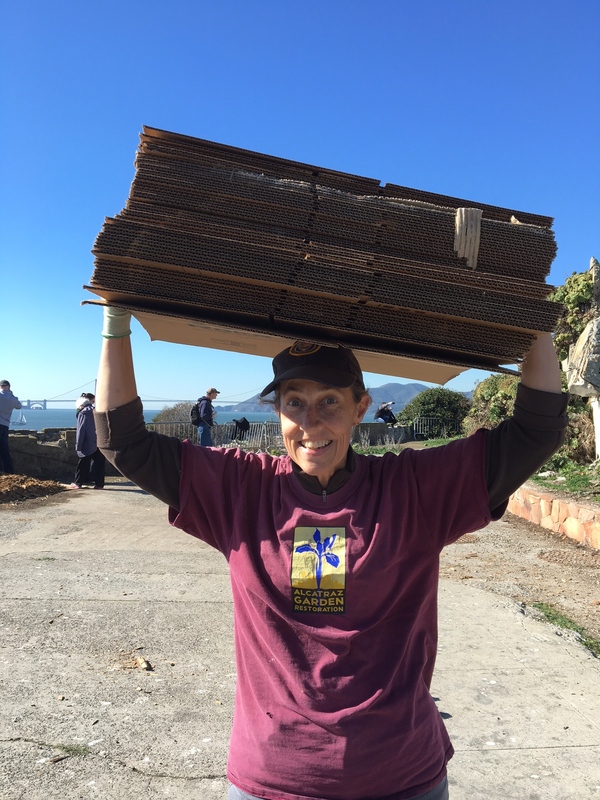 Before volunteering at Alcatraz, I worked at a summer camp in Maine that emphasized teaching ecology and sustainability to elementary and middle school aged students. After ten weeks of running around in the sun and eating lobster every Thursday I found myself asking the question that many college students find themselves asking after graduation, “So, now what?”. 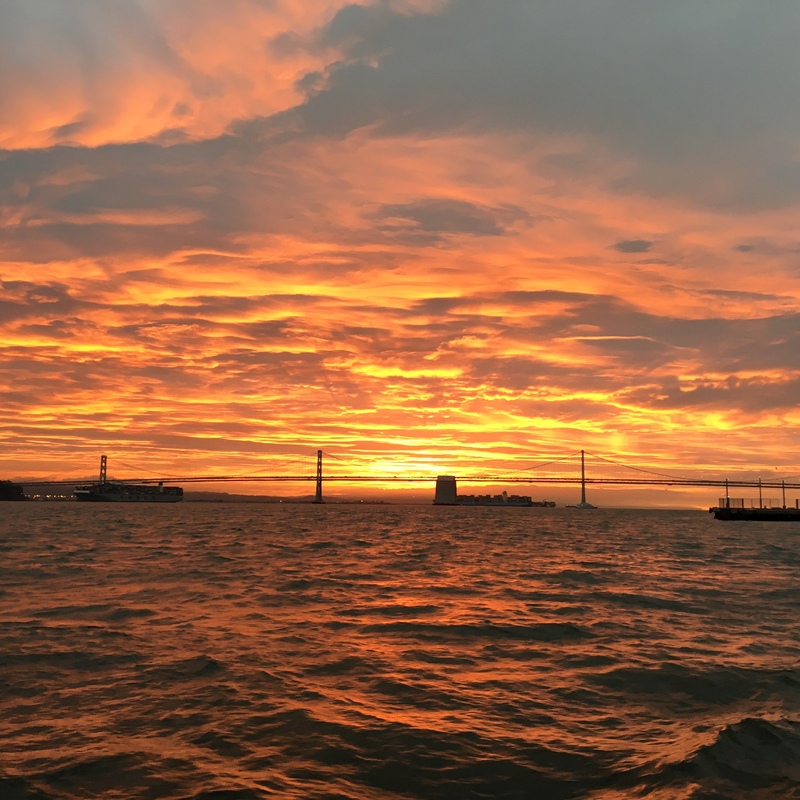 I began searching for jobs in the Bay Area and soon discovered that I needed more experience. 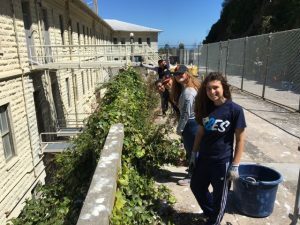 A friend of mine suggested to look for an internship using volunteer.org; this is where I found the post about volunteering on Alcatraz. 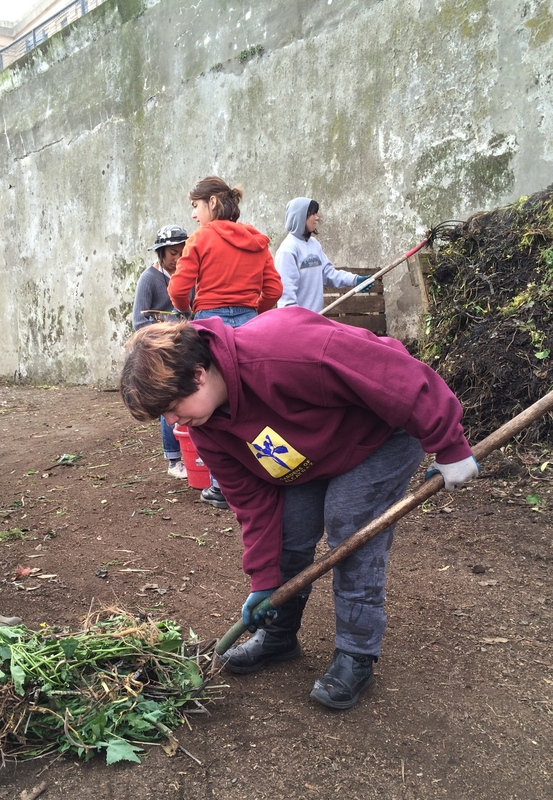 I thought to myself I could help with gardening (one of my favorite activities), volunteer (this means experience), and look for jobs at the same time. It seemed like a win-win situation. 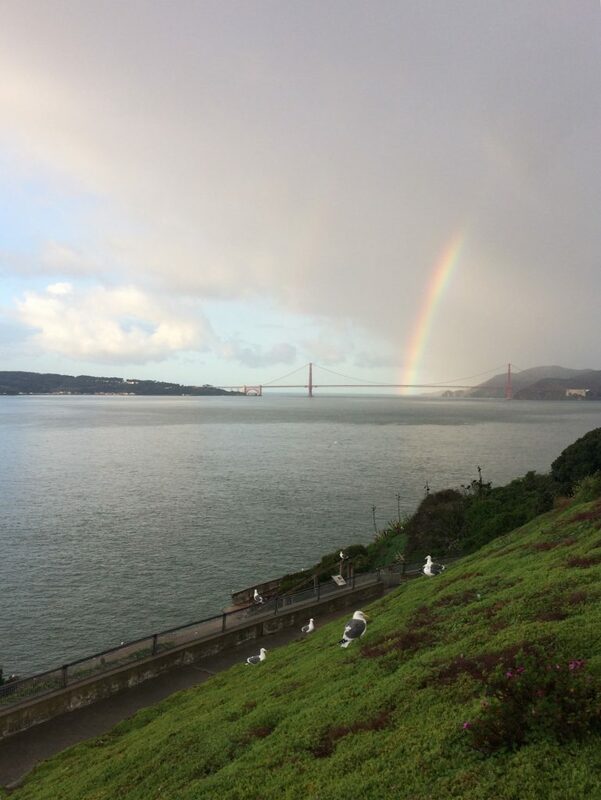 One of the first sights of the Golden Gate Bridge after a rainy day while volunteering on Alcatraz. Photo by Josefina Pacheco. I contacted Shelagh about volunteering in September 2016. 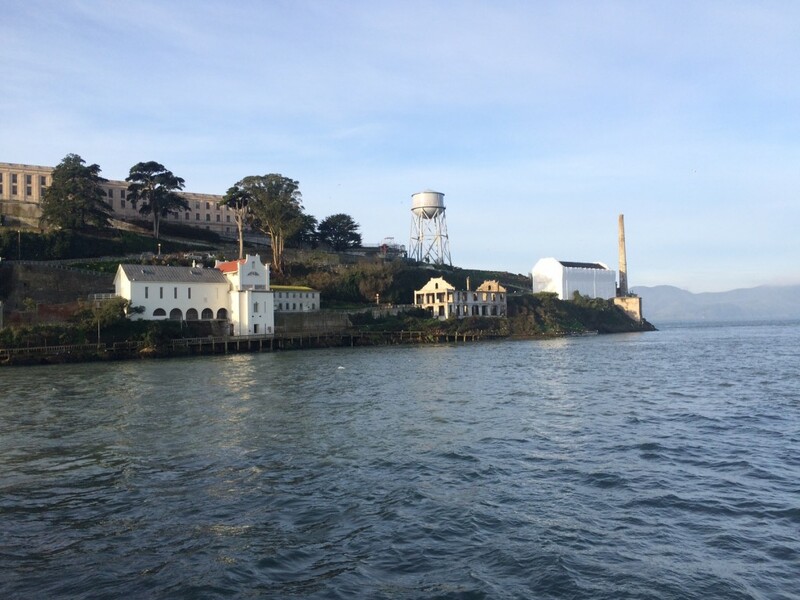 In early October, I was given the unique opportunity to apply for the intern position at Alcatraz. After a cover letter, resume, and interview I became Alcatraz’s newest intern. As an intern I now get to go on the ferry five days of the week (yay!). Twice a week I work with the volunteers which usually starts off with answering the question “So, what are we doing today?”. 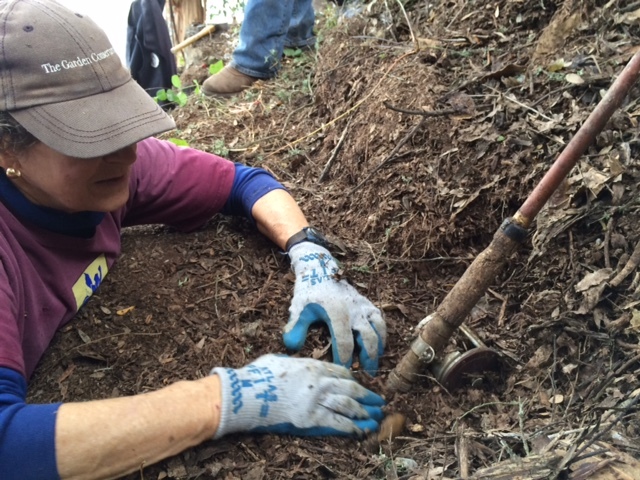 I then quickly take attendance and work alongside the volunteers for the day’s project for the remainder of the morning. On the other days of the week, I work one-on-one with Shelagh. 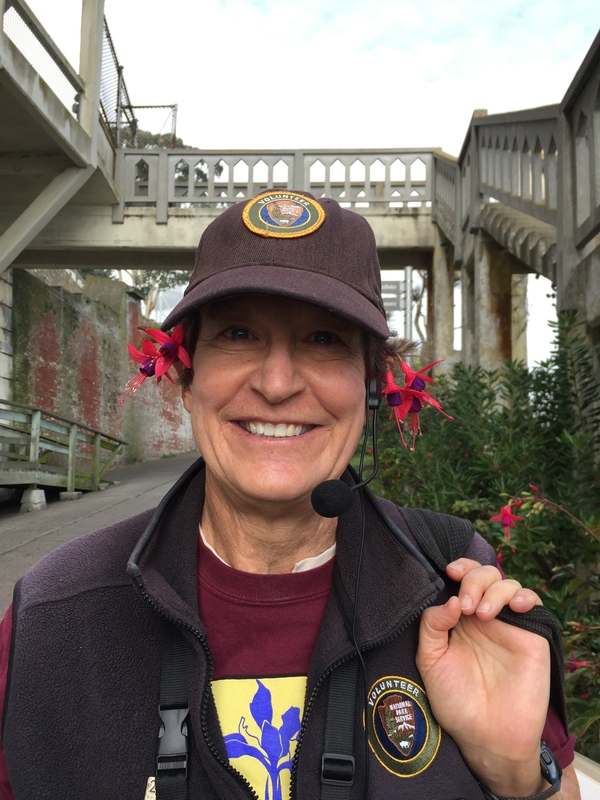 The day’s schedule varies day by day but some of the more notable ‘behind the scenes’ projects include: learning to prune roses, learning to transfer seedlings to planting pots, propagating succulents, assist with leading volunteer groups, and taking pictures of the watercolor paintings from the Alcatraz Florilegium next to the actual flowers from Alcatraz. 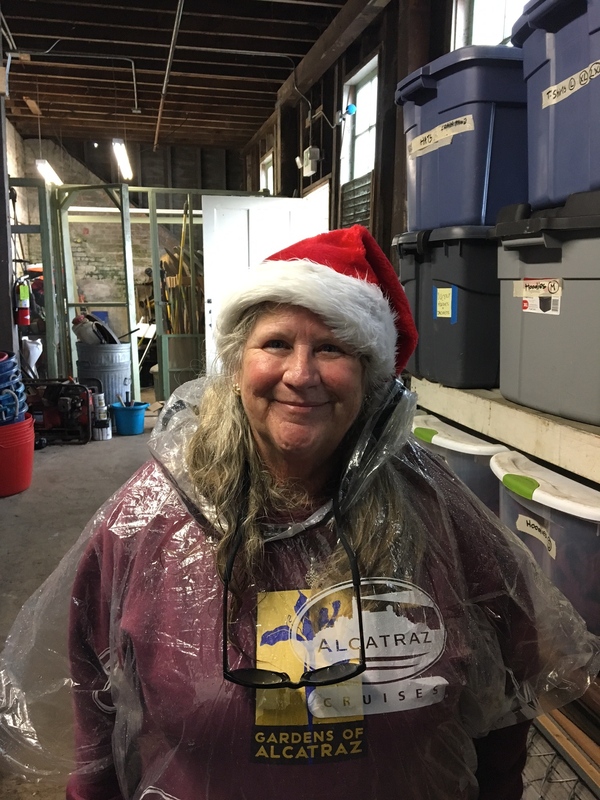 Additionally as an intern, I’m learning in greater depth about gardening and plant maintenance in general, along with gardening specifically on Alcatraz and its history. 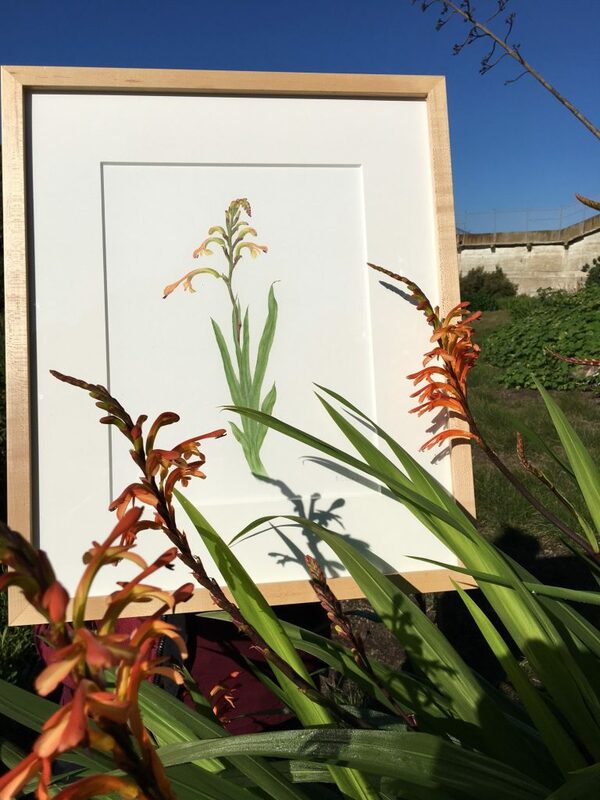 A watercolor painting of a chasmanthe from the Alcatraz Florilegium next to a chasmanthe near the West Side Lawn. 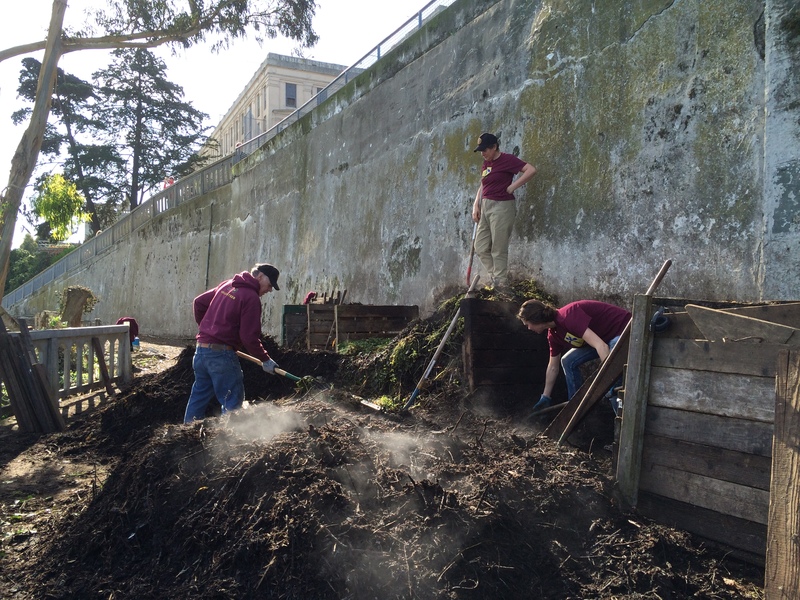 (The notable Gardens of Alcatraz burgundy sweatshirt can be seen attempting to blend in with the background). Photo by Shelagh Fritz. 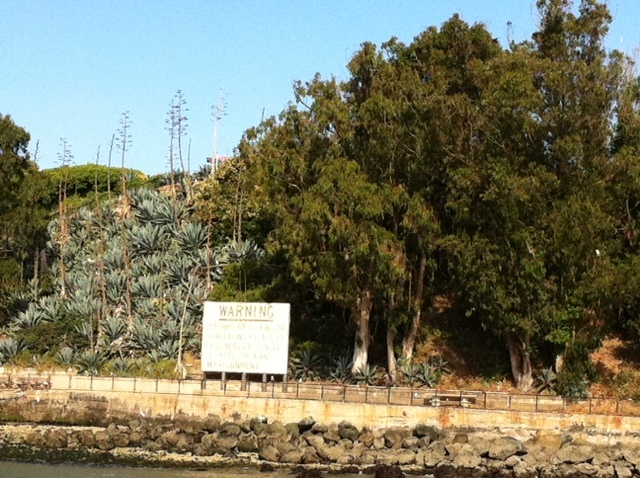 To help learn the names of the plants of Alcatraz I take pictures of them and then add their names to the image. 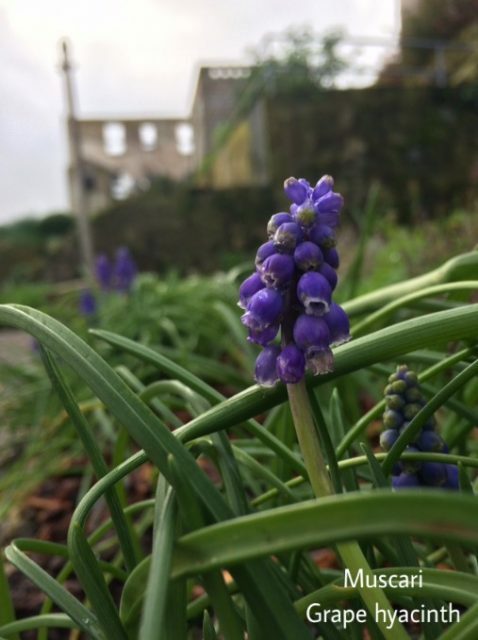 For example here is an image of muscari which is often called grape hyacinth in Officers’ Row. Photo taken and edited by Josefina Pacheco. What many people don’t know is that as an intern one gets a stipend and housing at (one of the most breathtaking places) the Marin Headlands. 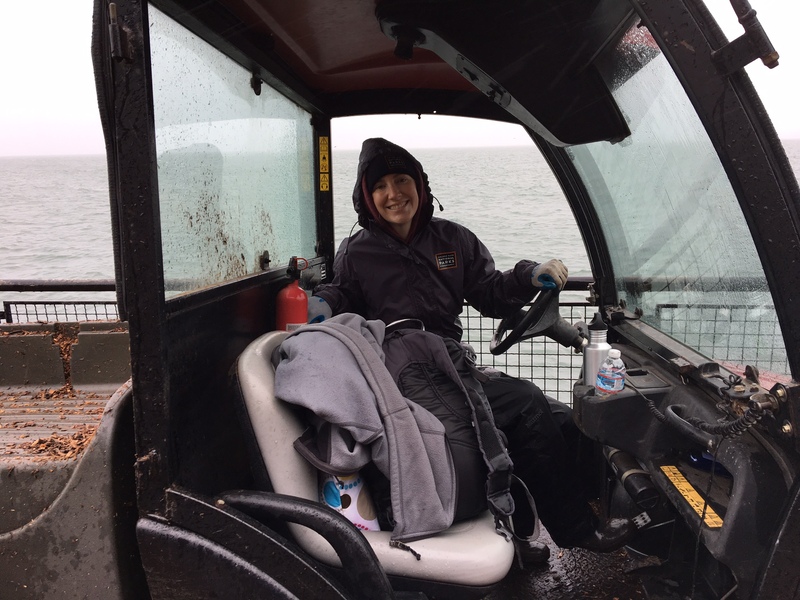 At the Headlands, other interns from other parts of the Park live there as well. 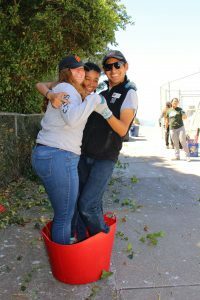 To help meet even more interns, specifically those in the Presidio, there are monthly intern swaps. 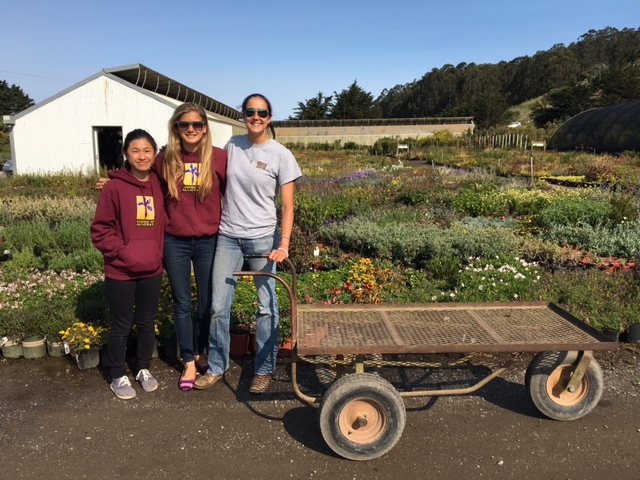 At a swap, interns get to go to another park site and volunteer there for a day (so far I’ve only participated in the Milagra Ridge intern swap where I planted native grasses). To further enhance your knowledge there are Park Academy Classes held a couple times a month. The topics range from botany to fire management to leadership training. 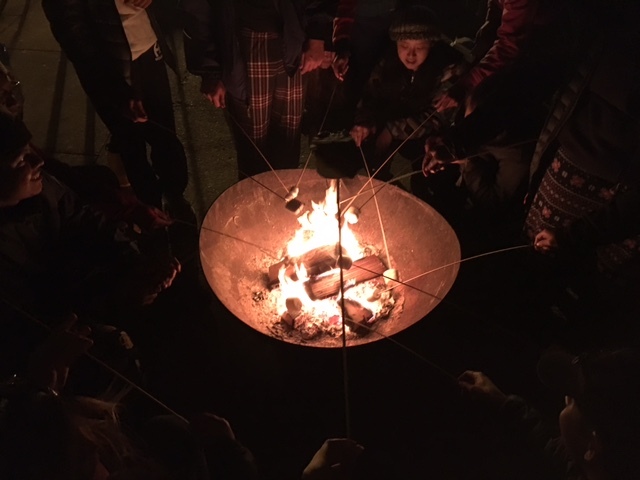 Being able to meet new people, volunteer at different parks, and learn more about whatever topic you want to learn more about makes this an incredible experience. 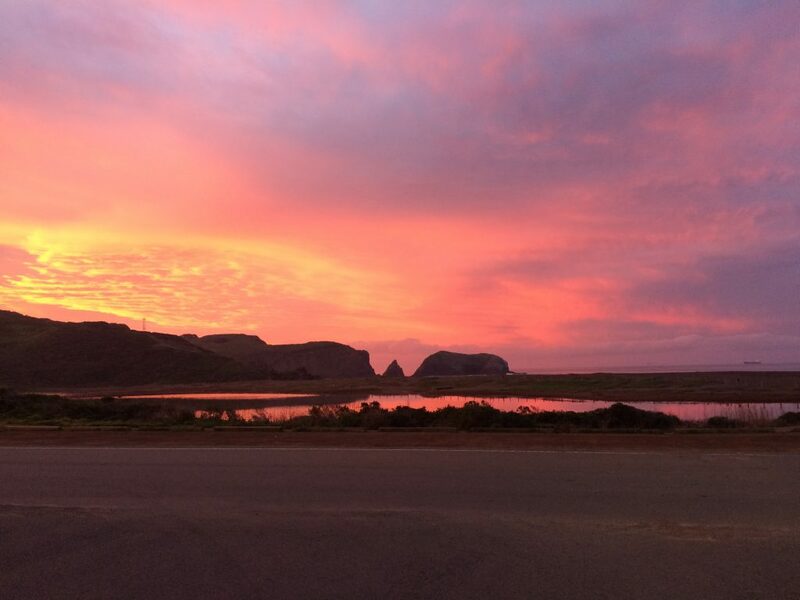 A stunning sunrise at the Marin Headlands on February 1. Photo by Josefina Pacheco. 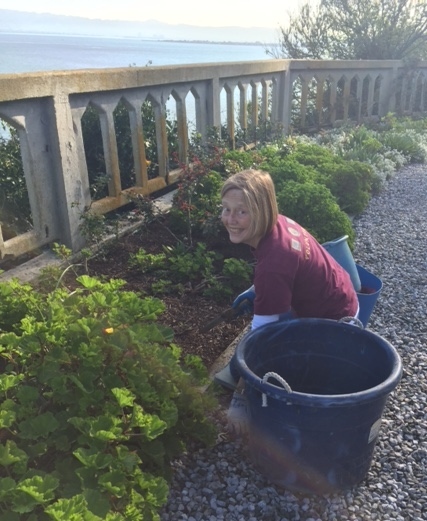 At first I was a little nervous about the transition from volunteer to intern but everyone (staff and volunteers) have been really helpful and supportive, so thank you and I’m looking forward to seeing the gardens through the seasons! Alcatraz these days is a bustling place of projects. 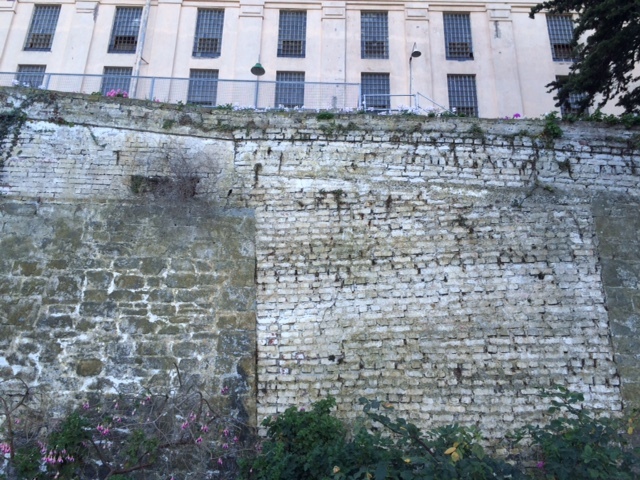 The big project of repairing the west side wall of the cellblock is very apparent but visitors can’t see the work being done as the scaffolding is wrapped in white plastic. The other significant project that was just completed at the end of December was in full sight of visitors and left a dramatic difference to the island. 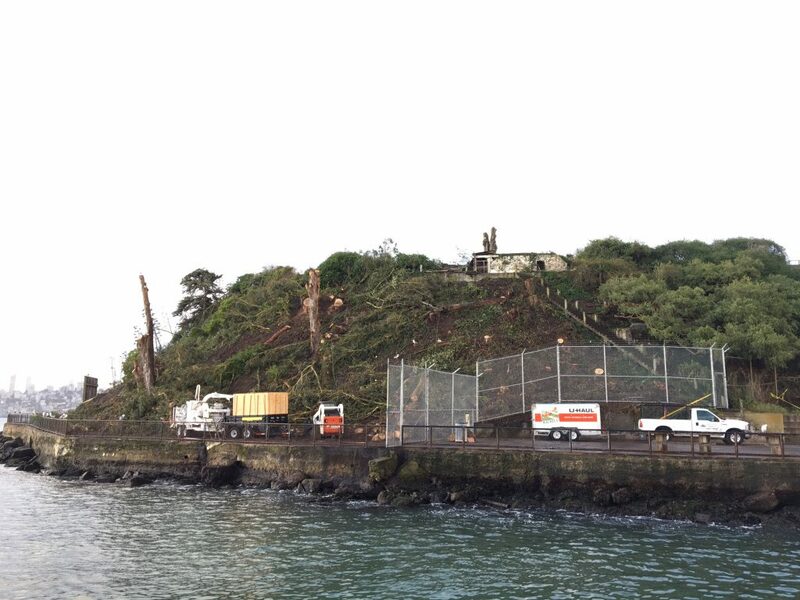 The Eucalyptus grove at the south end of the island (just off the dock), was removed. The project had been two years in the planning and finally had enough urgency and funding to make it possible. The trees, originally planted by the military in the early 1920s, had reached maturity and were a safety risk of falling. 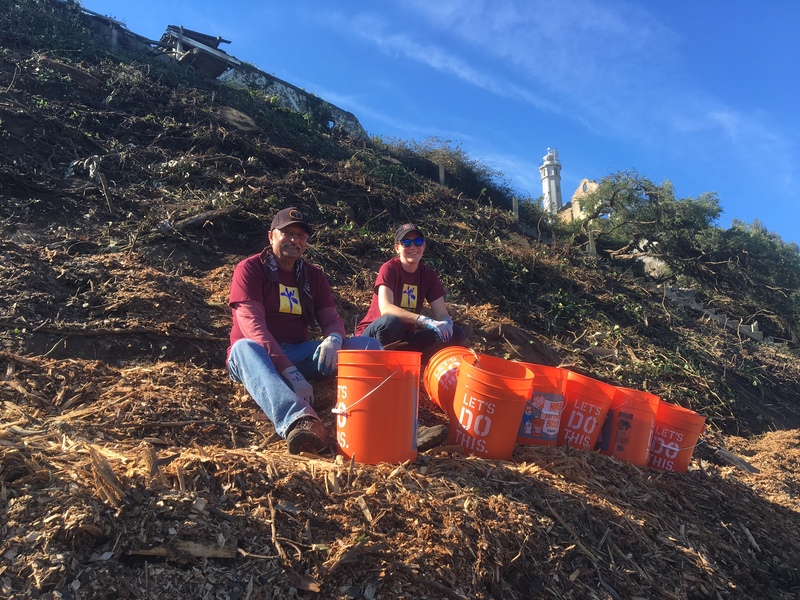 Marin County Arborists were trusted with the tree removal. 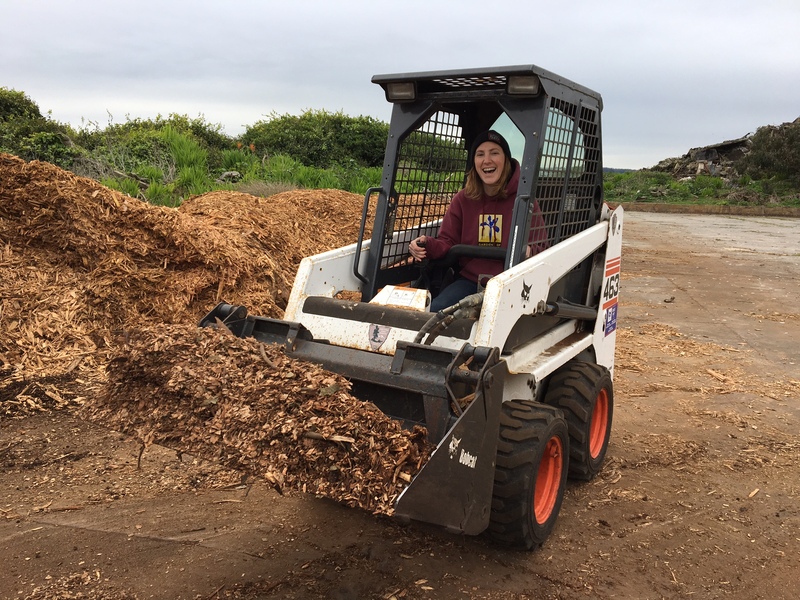 The company had previously worked on tree removals on the island and was familiar with barging equipment over and working around visitors. 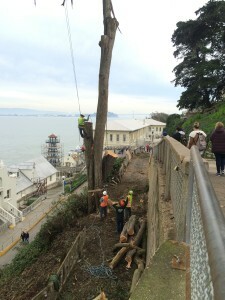 Sixteen blue gum eucalyptus trees and two non-historic Monterey cypress trees were removed and chipped over three weeks. 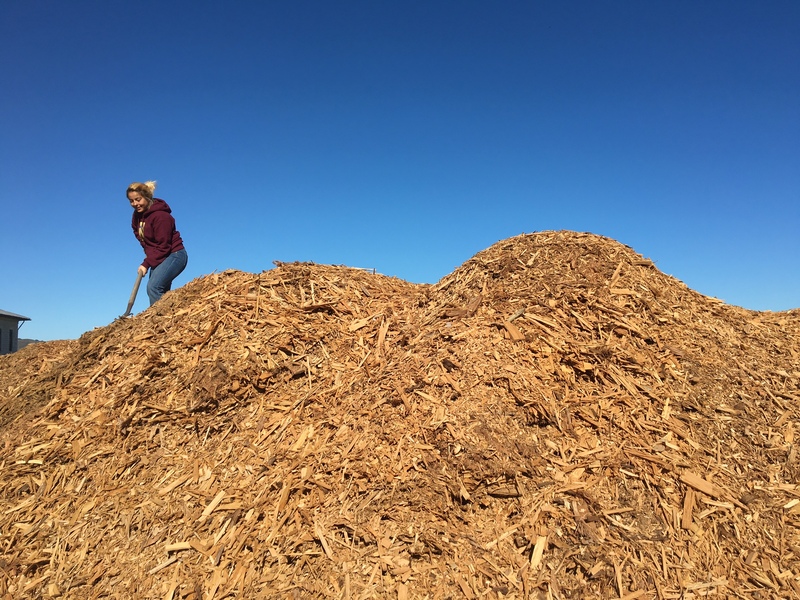 The chips were hauled to the Parade Ground to be stored until the National Park Service’s archeologist had a chance to examine the bare slope for evidence of military construction. We received the ‘all clear’ within a day of the trees being removed and we set to work! First, chips from 18 trees is a heck of a lot more than I could envision! 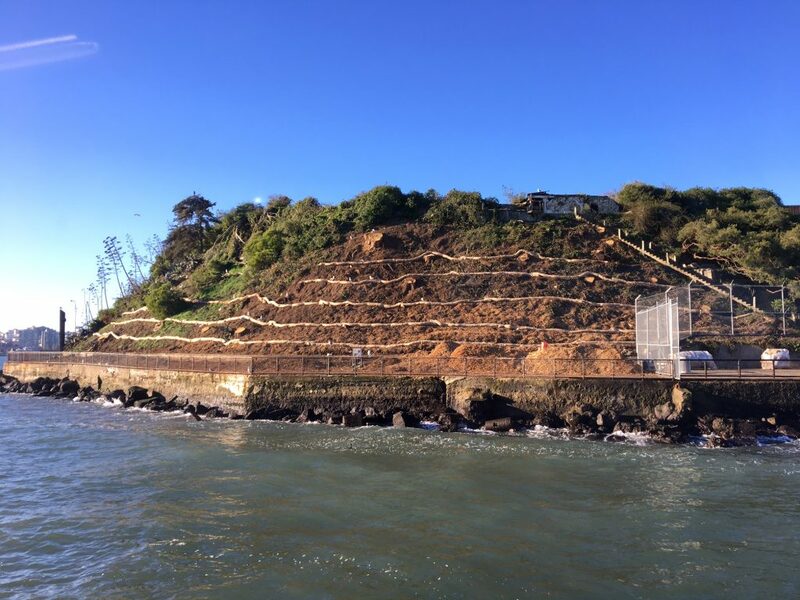 The recommendation from consulting arborist was to put the chips back on the slope to a depth of 4”, place jute netting over top and anchor wattles horizontally across the slope to stabilize the slope. The slope had been eroding badly for years, so this would be the perfect opportunity to stop the erosion. 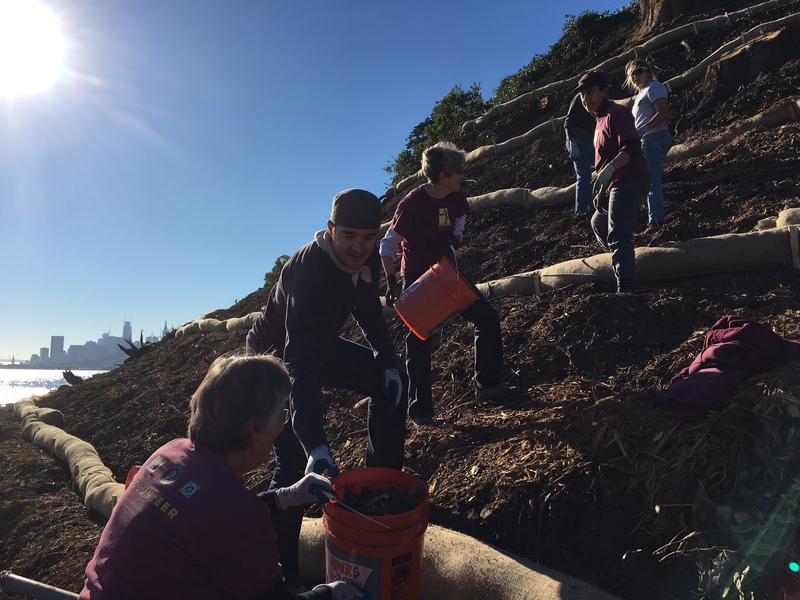 Volunteer groups were enlisted to manually place the chips on the slope. 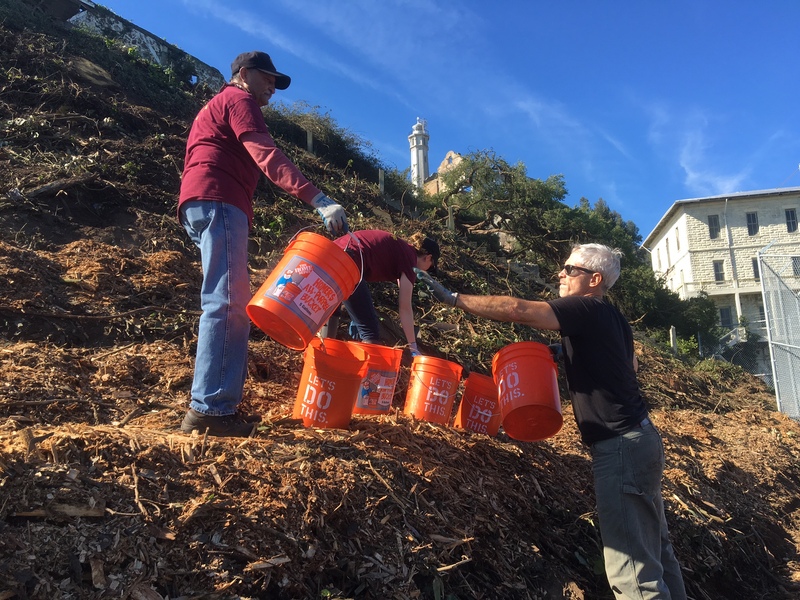 With bucket brigades and teamwork, the slope was covered over a month. 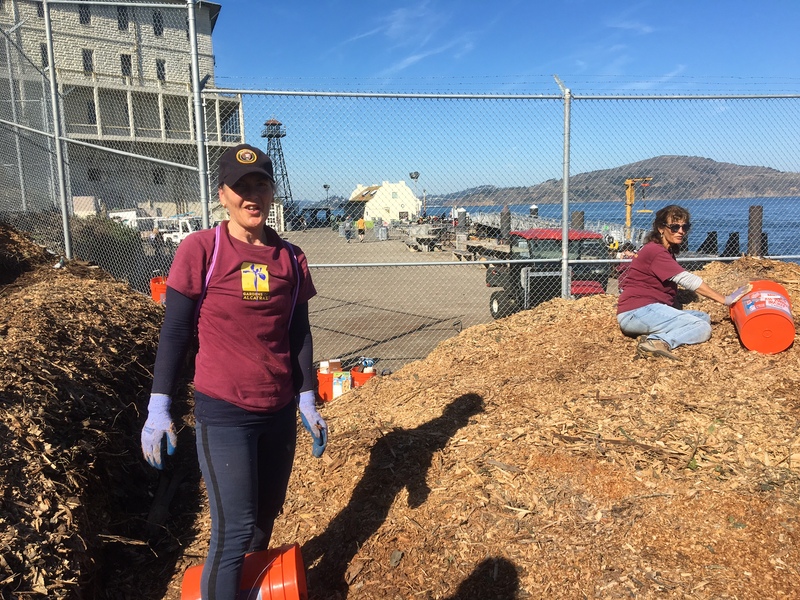 The Golden Gate National Parks Conservancy’s Stewardship Team (of which the Alcatraz Gardens is a division within the company’s organization) were set to take a day off from their normal sites and lend a hand. 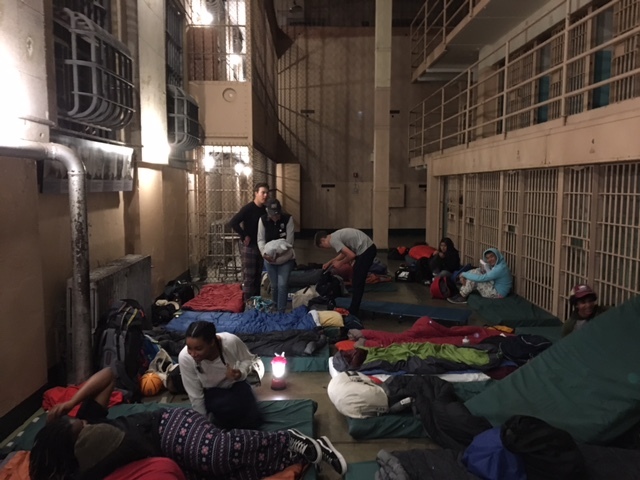 To sweeten the deal, an overnight was planned (and what better way to say thank you than a night in solitary?). 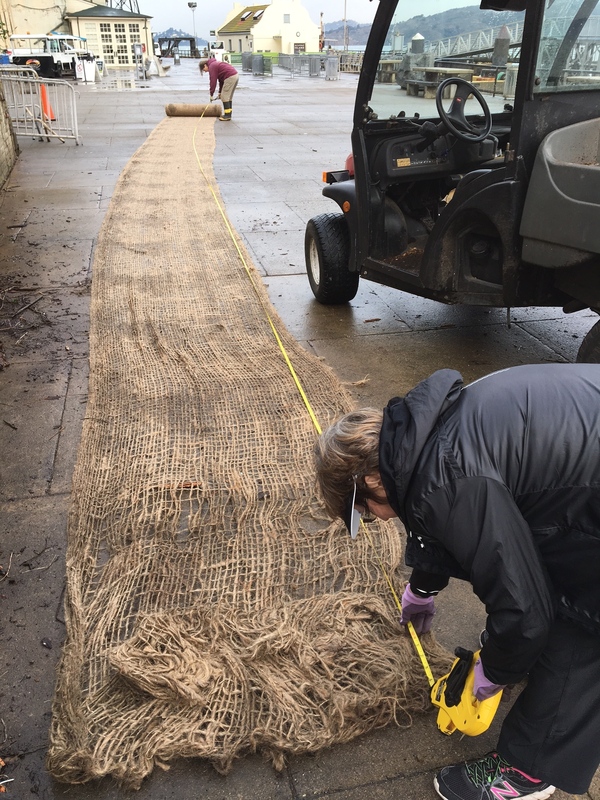 Once the chips were in place, the jute netting could be placed on top. The rolls were heavy and we soon figured that cutting them first was best. 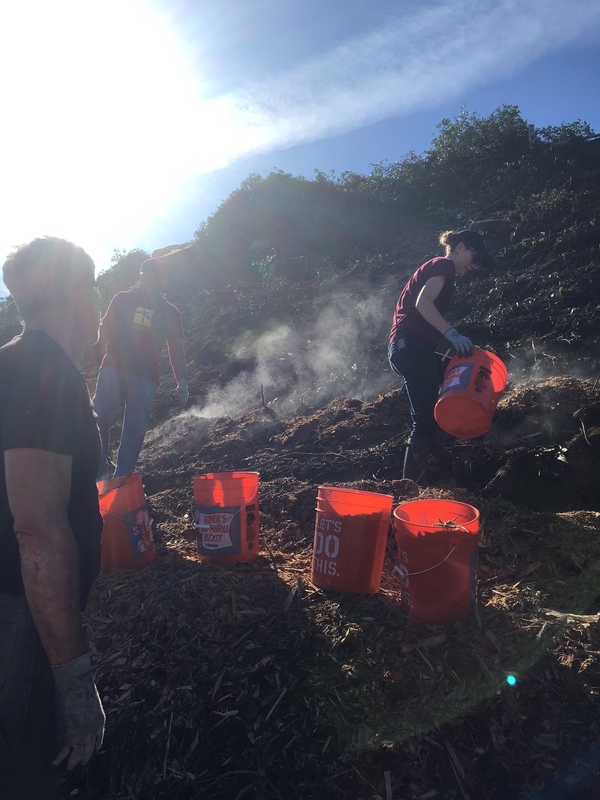 Aside from the Stewardship Team, four corporate groups and the regular drop-in garden volunteers pitched in to help spread the mulch. 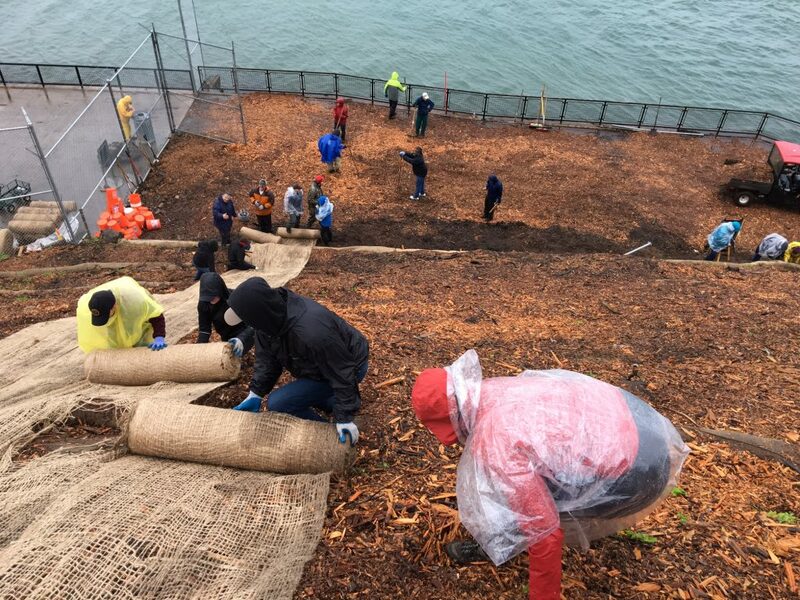 In total 900 yards of jute netting was placed and 750′ of wattles were installed. 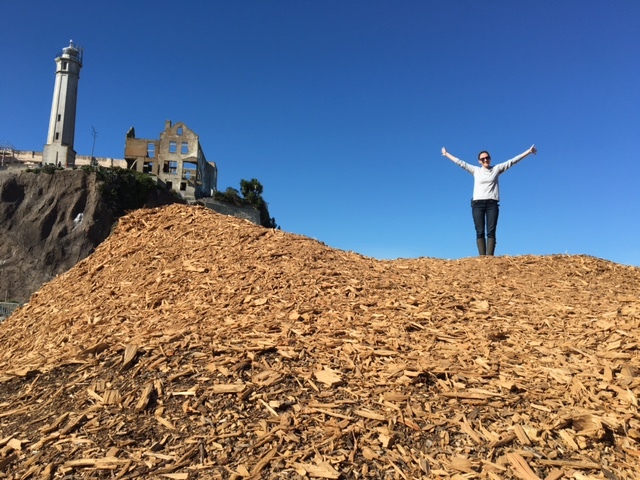 The slope will be replanted with Eucalyptus cinerea ‘Pendula’ in September 2017 in keeping with the historic look of the island. On another note of discovery, the perimeter wall of the Parade ground was further revealed along with the basement of one of the former cottages. And a new fern was found growing! With more years of planning to come, hopefully this neglected garden are will be the next focus of garden preservation. 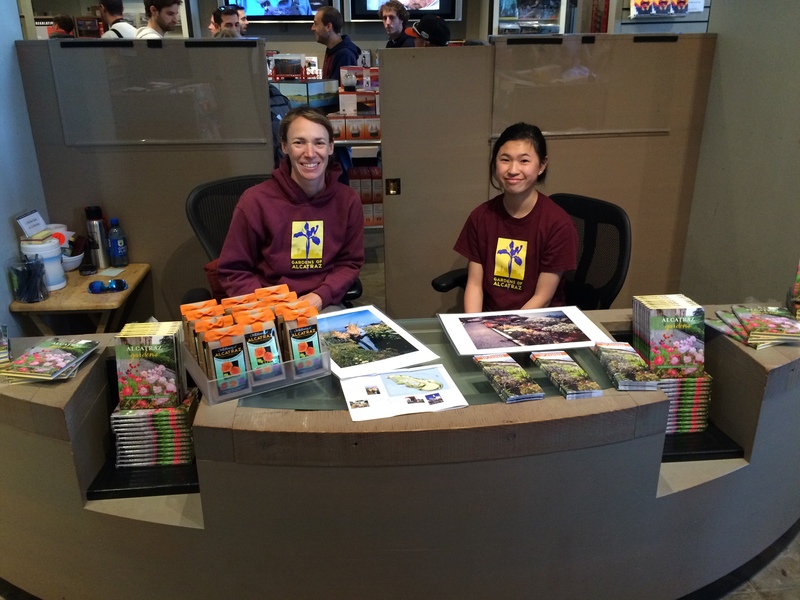 The gardens were fortunate this summer to have two youth interns through the Parks Conservancy youth program. 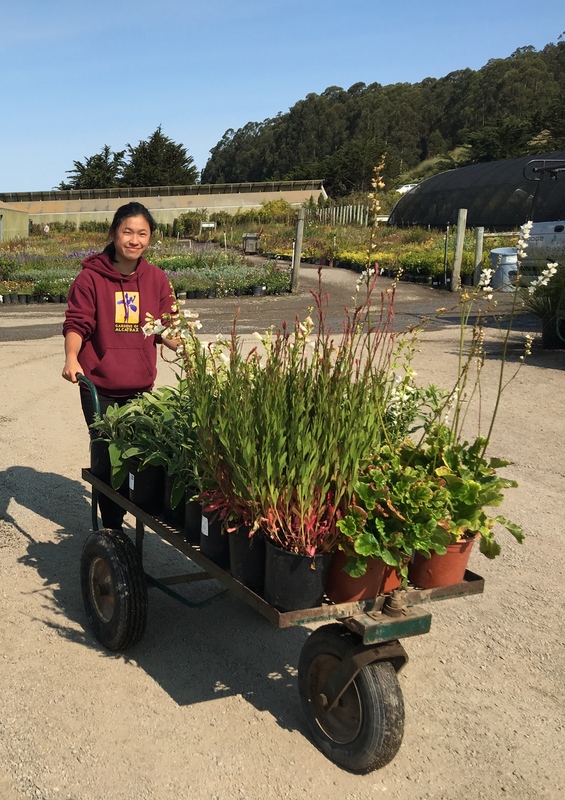 As they wrap up their 140 hours working in the gardens, there was still another skill they needed to know – how to select plants from a nursery. 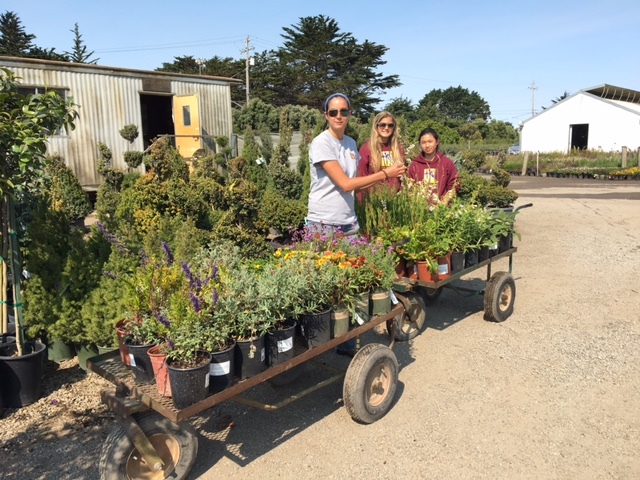 We headed down to Pacific Nurseries, a wholesale nursery in Colma to do our shopping. 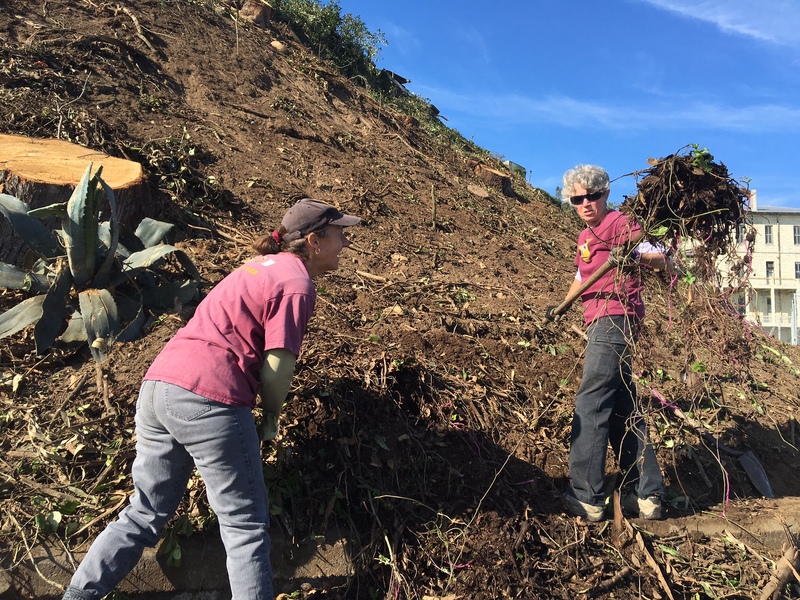 Our mission was to find plants that would fill in areas on the windy west side of the island in the Prisoner Gardens. Sections of this garden are always struggling to cope with the extremes of heat and fog, wind and the curiosity of gulls, even after the gardens were restored in 2009, they still aren’t quite right. 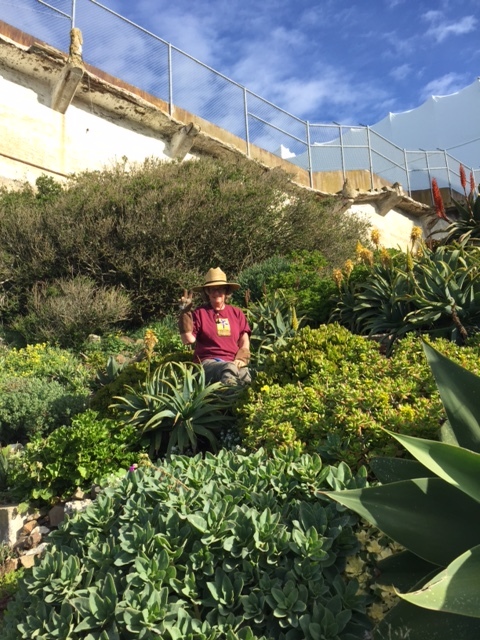 Upon pulling into the parking area, my eyes always light up with seeing the plants laid out in groupings of perennials, shrubs, roses, succulents, annuals and shade lovers. Sometimes, I place an order and can go and have everything ready, but often, I just see what is available and chose from the vast selection. For the Prisoner gardens we were on the hunt for perennials, mostly Salvias as the ones we already have are thriving. We started with 1 gallon pots of Salvia clevelandii. The first thing to notice was the health of the leaves and checking that the stems are not broken. Salvia clevelandii tends to be brittle anyway so extra care needs to be taken while handling them. 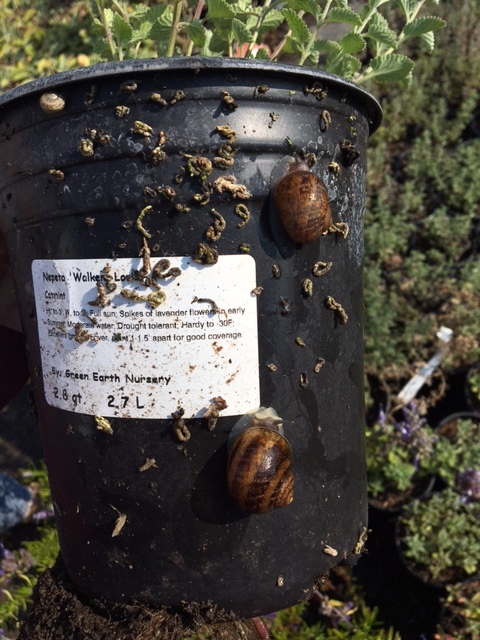 Turning the pots around, it’s is essential that we are not taking any hitchhikers to Alcatraz – namely snails and slugs and weeds. looks like is a lot easier when standing in a nursery. 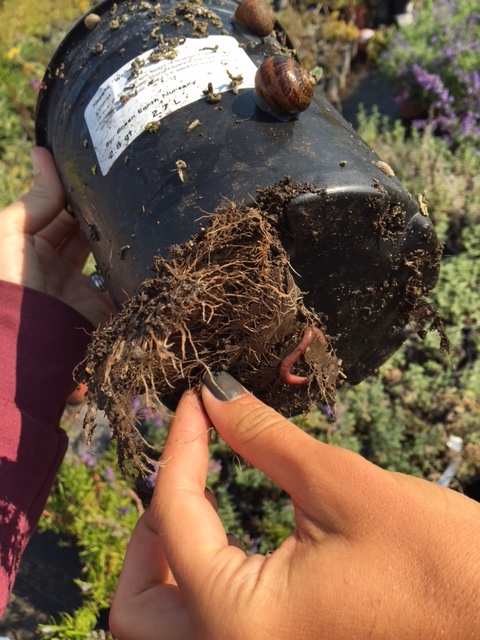 While Pacific Nurseries have excellent plants to choose from, sometimes roots get circling the inside of their container and can even root into the ground through the drainage holes. Plants like this tend not to adapt well once wrestled out of their stricken home and in bad cases, there may be hardly any soil left in the pot, leaving the plant suffering from drought as well. 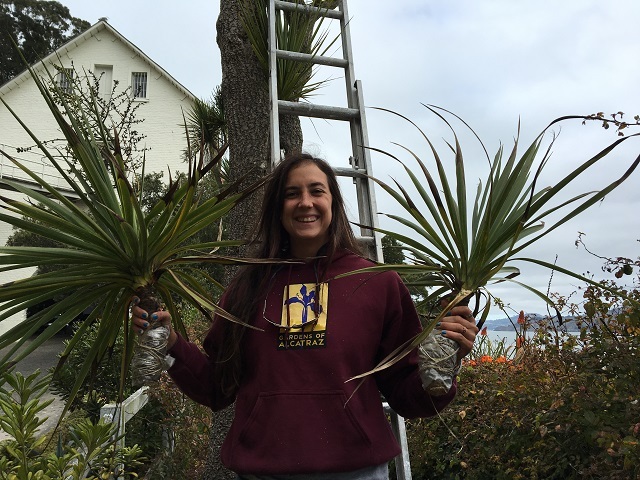 With plants we choose, we have to go through quite an effort to haul them to the boat to get them to the island. Checking that the plants are well watered helps the plants with the trip. The interns could feel the weight difference in pots that were dry versus heavier pots that were well watered. Of course, the growing median makes a difference too (but we’ll save this lesson for another day). We soon had our carts full and packed the van! While we checked out with our purchases, the interns had 15 minutes to run around and look at all the types of plants. I’m sure their Instagram accounts are full of selfies with the plants. Pulling off the freeway to come back along the Embarcadero, the van was noticeably quieter – a look into the back showed both interns had fallen asleep. Definitely a sign of a great shopping day! Most people are familiar with the idea of a portrait – usually it brings to mind a picture of a person that captures a close up of their face and maybe tells something about the person’s personality or life. It turns out you can also do portraits for plants! 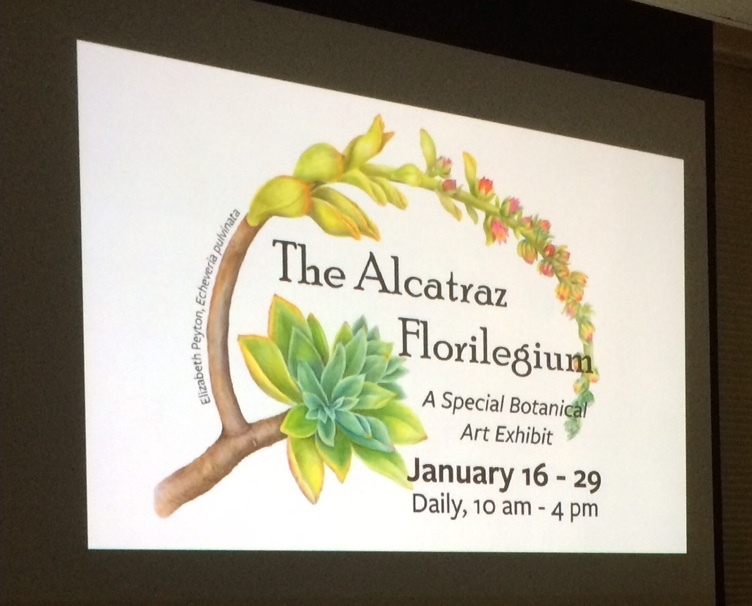 Last week, I had the opportunity to go to a talk at the Marin Art and Garden Center in Ross to learn how to build a Photo Florilegium from Saxon Holt and David Perry. Florilegia (plural of florilegium) were started by Victorians to document a specific collection of plants, usually painted with watercolors. The illustrations would be bound in a book and later became popular as framed prints. With the Alcatraz Florilegium in its final year, I was curious to see what a photo Florilegium is and hopefully pick up some tips for taking better photos of the gardens and plants. 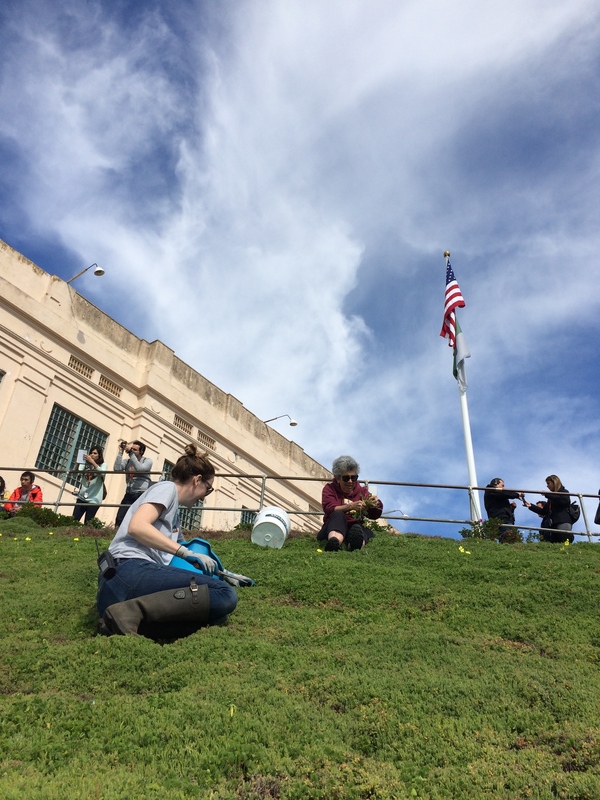 The Alcatraz Florilegium captures the collection of plants on Alcatraz. First to speak was Saxon Holt, a renowned plant photographer who has several e-books and bestsellers. A successful garden photographer for over 40 years, Saxon had plenty to share with us. Saxon is perfecting a technique called ‘extraction’. Done in Photoshop, close-up shots of a plant are taken. 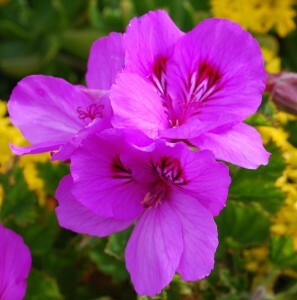 Usually a number of exposures are taken to get a portion of the plant entirely in focus with sharp edges. The plant is brought forward out of the background. This technique has many cool details that are missing in a typical hand painted illustration. 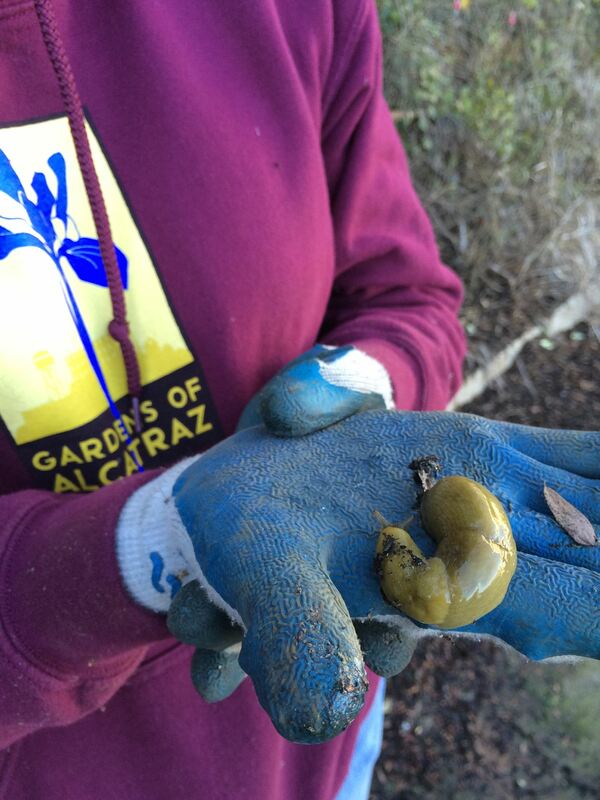 First, a photograph captures the plant where the gardener chose to put it, with the colors in the background and showing the plant in context with its surroundings. Second, a photograph only records a moment in time. The portrait captured is never going to look exactly like that again. With the ease of recording GPS coordinates, it is relatively simple for anyone to return again and again to the same plant to capture stages of the plant’s life – creating a true portrait of the plant. 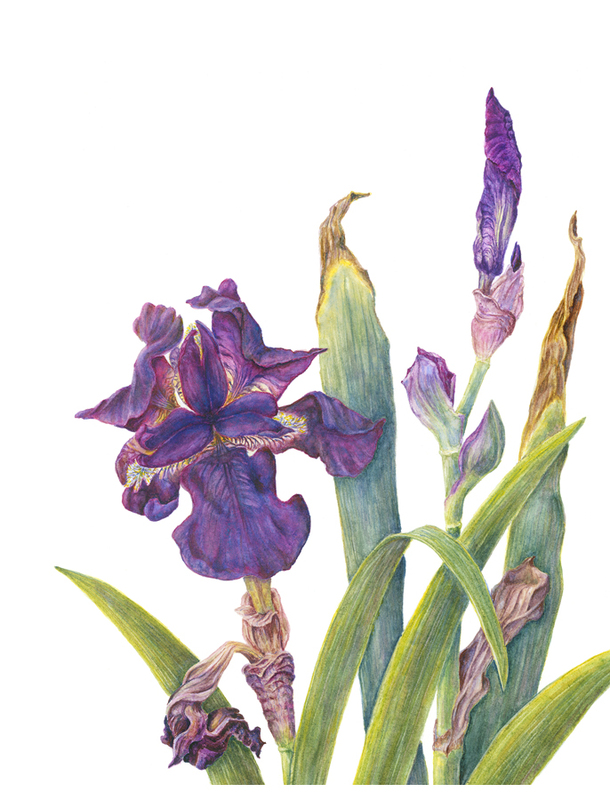 Iris ‘King’s Ransom’ illustrated by Catherine Dellor shows the plant as it grows in the gardens with the fading leaves. illustrations that I’m drawn to is when artists paint the brown tips on leaves, rust and when the plants are setting seed and going dormant. This is truly how the plants are. David Perry next spoke on tips for taking plant portraits. One point David was quick to say was that you do not need an expensive camera to take great photos. The main thing is to have the eye to know a good shot. Think of photographing plants as you would people, keep in mind that you want to tell a story. David explained that a common problem when taking photos is that most people take pictures of nouns (snapping pictures of a tree, flower or a landscape). What are lacking are verbs, adjectives and prepositions. Brushing up on grammar school, this simply means don’t take mug shots of plants. Take photos that say something. -Look up / Look Down – people tend to take photos of what’s in their view. With the average height of people being between 5’3” and 6’3”, most photos are from this perspective. -First / Last light of the day is best – the best light is already gone by the time people are putting the second cream in your coffee. Stick around after sunset for the best light. White flowers almost will glow in this fading light. -Keep going back – show different moods of the same plant in different light, seasons, capture the telling detail of the plant. -Be mindful of what’s in the background – avoid getting houses, and you can also create your own background with sheets of patterned paper for close-ups. -Photo apps that David likes – camera+, handyphoto, overphoto, and mextures. All of these are a few dollars each and are fun to play with. David also said ‘it’s not fair to let the plant do all the work’. He recalls being intimidated by ‘how pretty she was’ when referring to Rose ‘Felicite Hardy’. Listening to these energized photographers, it was easy to see why they are so passionate about plants and photography. 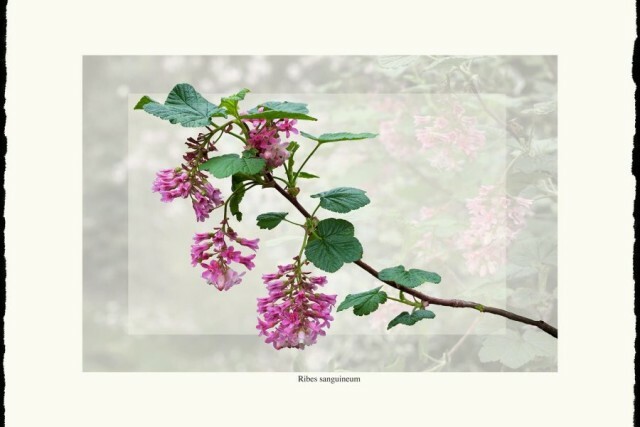 Gardeners are passionate to plant and to care for a garden, and now another step is to take photos of the plants you have chosen to be a part of your garden – creating a Photo Florilegium of a garden that is unique from any other garden. Alcatraz, as a Historic National Landmark, has a pretty constant look, even the silhouette view of the island from the city is considered historical. However, over the past two weeks, the look of the island has changed dramatically. Unlike earthquakes that suddenly jolt the landscape into a different look, tree maintenance can (and should be) planned for. Like all changes to the landscape, approval from the National Park Service was essential, especially when two one-hundred year old trees are being questioned. As a starting point, the Cultural Landscape Report that was adopted in 2010, had made the recommendation for tree work on the island’s historic and non-historic tree. The difference between historic and non-historic is any tree growing on the island between 1854 and 1963 is considered historic – any tree outside of that time frame is non-historic. Tree maintenance, and especially tree removals, are quite expensive. With limited funds, we realized we could not do all of the recommended work at once, but would need to spread it over a few years. To help us decide what work should be done right away, tree consultants were brought in. The consultants evaluated each of the historic trees on health and safety. Non-historic trees were not examined as they will be removed anyway and were not posing any safety hazards. The consultant’s report made a few recommendations that went against the recommendations in the Cultural Landscape Report. With experts advising us, we decided to go with the consultant’s report. To obtain the National Park Service’s final permission, a detailed description of all the work to be performed needed to be entered into the Planning, Environment and Public Comment (PEPC). A well written summary answers the 5 W’s (who, what, where, when, why) and the 1 H (how). Maps and diagrams may be attached and often help to explain to the people who review the projects who are not familiar with project sites. For the tree work, an administration approval was granted, however, sometimes a presentation must be made to a committee. The consultant’s gave safety priority ranking and trees along the main roadway that leads to the cell house were ranked highest. The consequences of a tree falling along the main roadway would have frightening implications for visitors and staff, not to mention close down the only road that leads to the cell house. Loud disruptive work must be completed before the annual bird nesting season begins on February 1, so a push was on to get the work done. 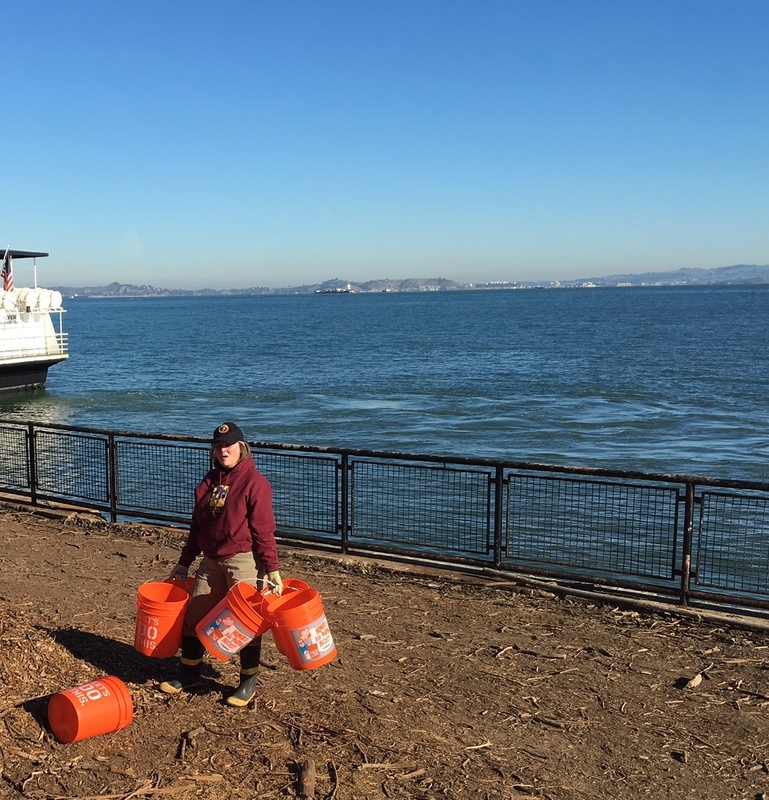 Sounding like an opening scene for a scary novel, the arborists boarded a ferry on a dark and stormy morning out of San Francisco with their chainsaws in hand. Starting work on probably the rainiest day was just bad luck. 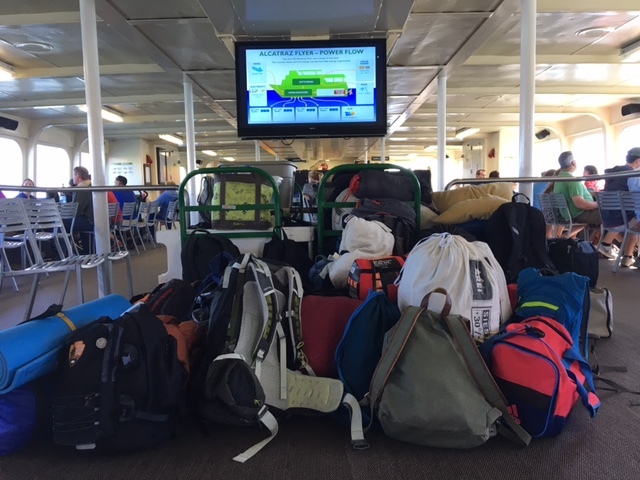 Nevertheless, lines got strung up in the trees, equipment moved to where it needed to be and the next morning work started promptly at 6am with the ferry ride. The arborists made steady work pruning the large Eucalyptus and moved onto various cypress along the roadway. The arborists were more like trapeze artists up in the trees. The crews skillfully tying limbs to be lowered to the ground instead of just letting them drop. Visitors actually cheered them on when large limbs were cut. The amount of light and the feeling of airiness was apparent to us immediately. Often you don’t notice how overgrown a plant has become. While it is sad that trees were cut down, it is important to remember that trees have lifespans as well. One of the trees will be replanted with another cypress and in another 100 years, we will likely cut it down again and replant. Even looking at historic photos from the military, there are many trees in the photos that are no longer there. Plus, for an island that originally had no trees, we should keep Antoine De Saint-Exupery quote from The Little Prince in mind ‘You become responsible, forever, for what you have tamed. 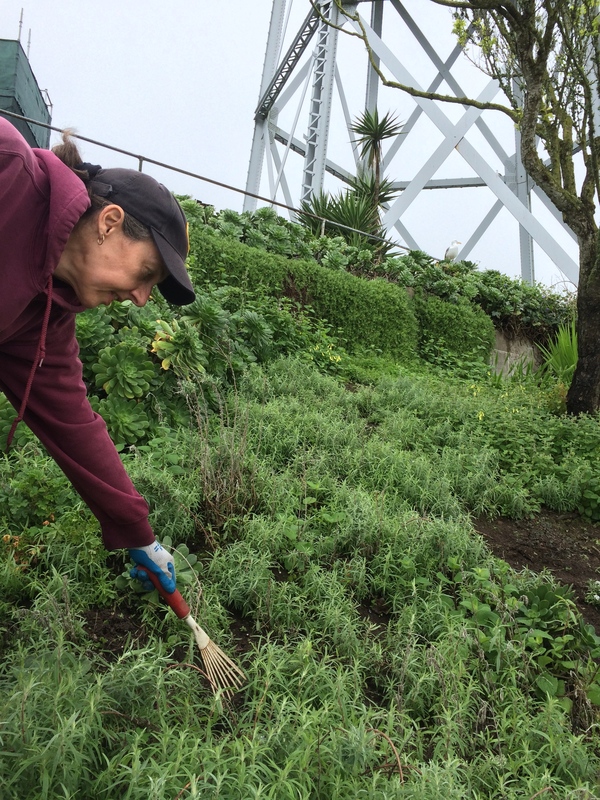 Past garden manager, Carola, is quoted in Alcatraz’s Discovery film as saying the gardening is like ‘garden archeology’. 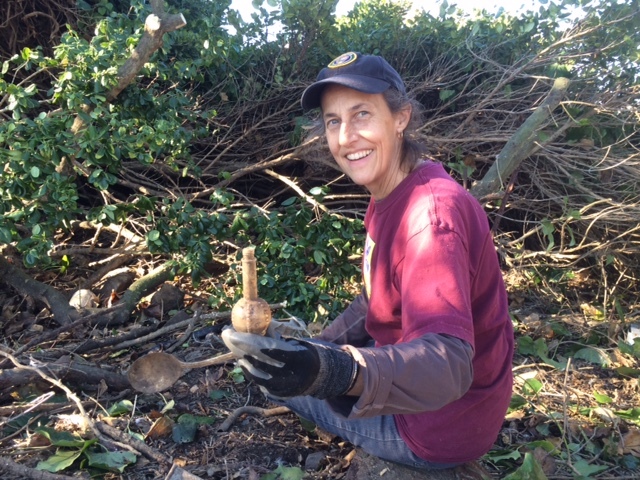 Her words perfectly described the work of clearing vegetation and finding artifacts and landscape features that had lay hidden underneath ivy and blackberries for decades. Her words are still very true today. 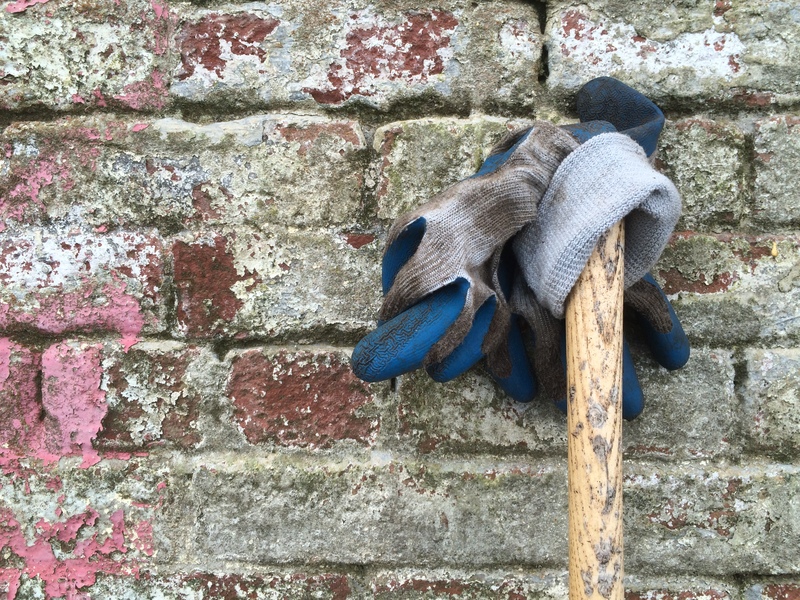 The garden crew has been in over their heads clearing ivy from trees and uncovering terrace walls. 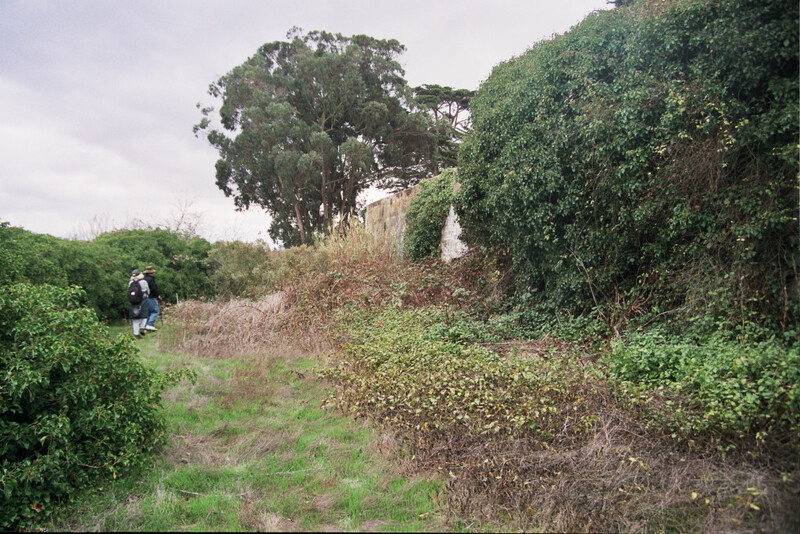 Using the Cultural Landscape Report for Alcatraz Island as a guide, permission was granted by the Park Service to clear overgrowth from known garden areas that no one had worked in since the prison closed in 1963. As part of the approval, garden volunteers and staff attended a lecture by National Park Service Archeologists, Leo and Peter. -take a photo with a point of reference in the background, not to zoom in on the object but give an easy way to find where the object had been found. A key point was to distinguish between a single item found and a ‘feature’. A feature, as we now know, is considered a group of artifacts. In the case of finding a feature, the objects should be left in place and give Leo a call. All of the objects found are taken to the Presidio archives where they are cleaned, recorded, and added to the collection. For garden artifacts, Leo has been marking the locations of the items on an overall map. Overtime, the pinpoint locations of objects give a big picture of significant areas, slow archeology in a sense. 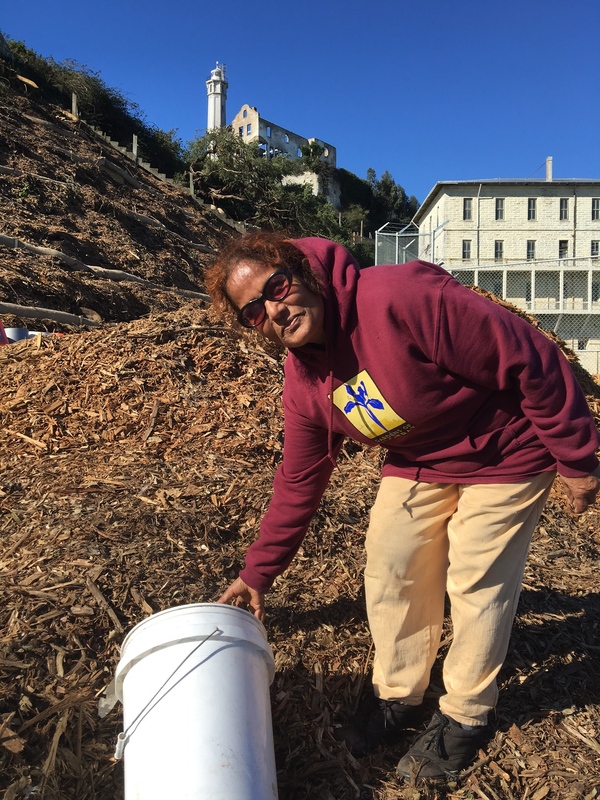 Most people think of Alcatraz as only a federal prison, but the island has layers of history that equals the city of San Francisco, where the story of the gardens is woven throughout. Seeing the island through Leo’s eyes was really, well, eye-opening. Landscape features that we always walk by, were given an explanation, or at least a theory that made us all think – ah, that makes sense. 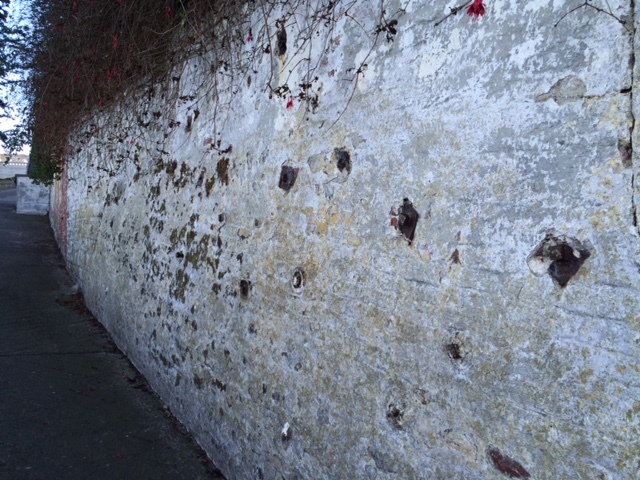 For example, many parts of the island had a whitewash over the bricks, stone and concrete. 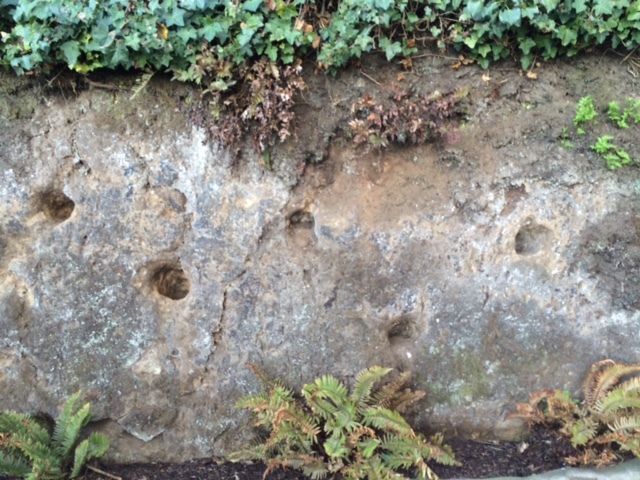 The whitewash façade has fallen away in many areas, but the anchor holes of the façade remain. Today, the holes look like planting pockets. We had always wondered about the evenly spaced shallow holes. They obviously weren’t big enough for a large plant with roots, or even to hold moisture during the dry summer. With Leo giving his theory of the holes being the anchor points, the holes suddenly made sense. 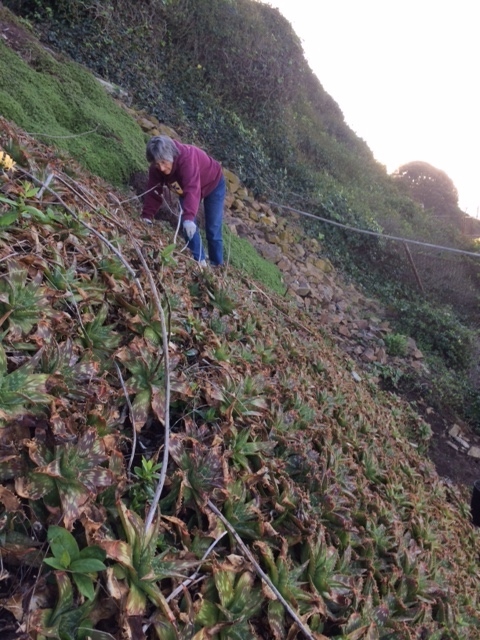 By chance, the cliff below the Warden’s house is being stabilized with the addition of fake rock being anchored with long bolts – just like was done long ago. 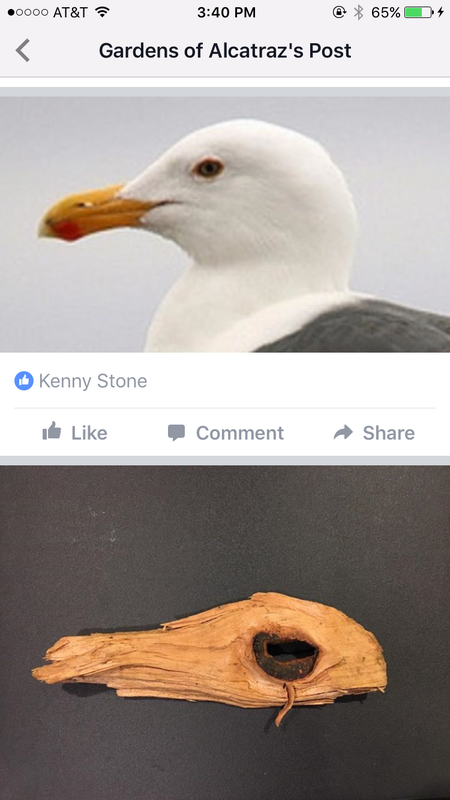 One of the coolest objects found was an arrowhead several years ago, and another arrowhead showed up a few months ago. Leo explained that the arrowheads can be dated by using the fact that glass absorbs water at a specific rate for locations. 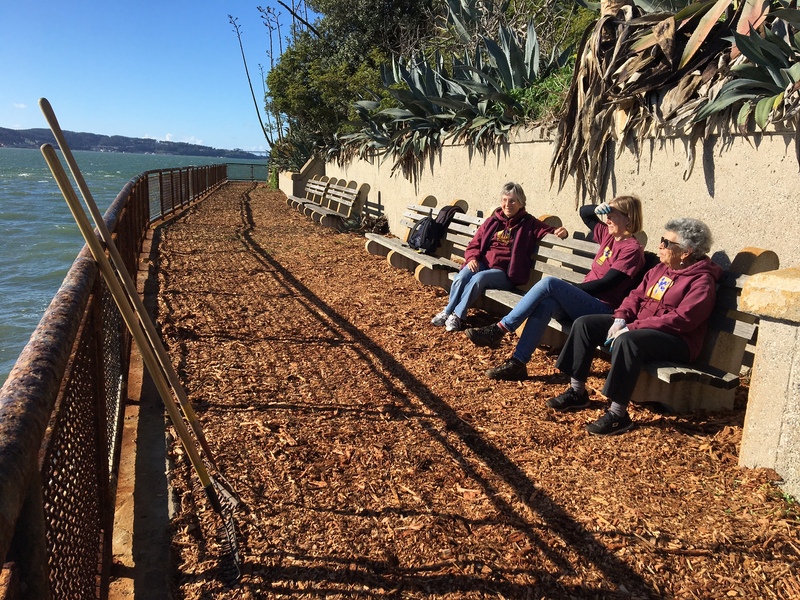 Other features of the island, are fun to speculate over – the bluestone found on the island is only found in a few locations around the Bay Area, Angel Island and Corte Madera. 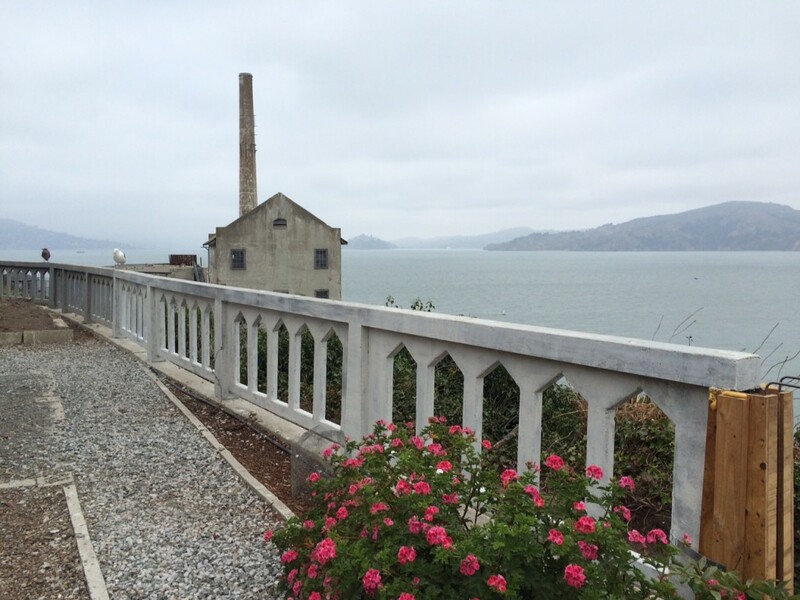 Not only did significant labour went into gathering the bluestone and hauling it to Alcatraz, but seeing it used for building reflects a known time period and a recycling of building material as well. Leo’s passion was evident as he said ‘some we will never learn but there is meaning in it all’. 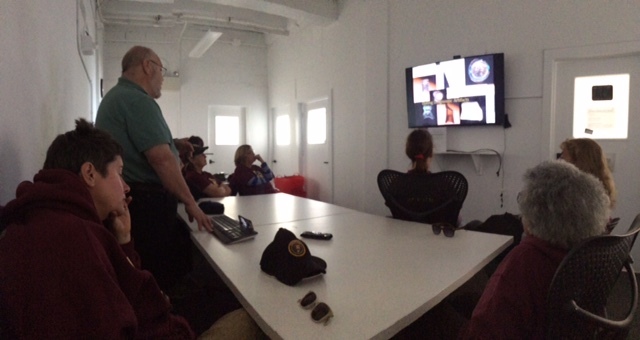 Our take away lesson from Leo’s talk was to “overly thoughtful and nerdy about everything you find”. 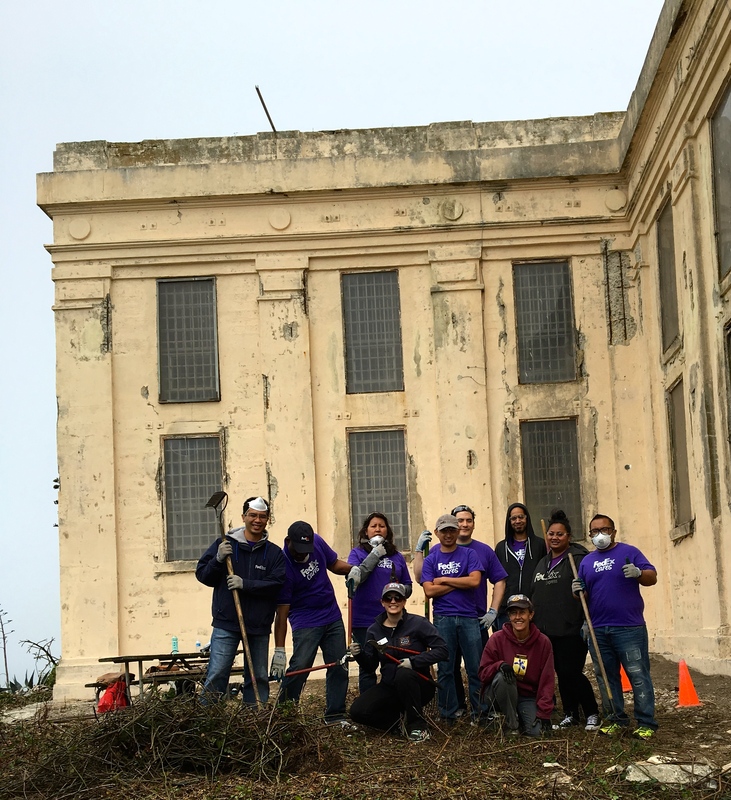 Did you know that when the cell house on Alcatraz was completed in 1912, it was the largest steel reinforced concrete structure in the world? The world of concrete has come a long way since then, becoming the main building material in pretty much everything from buildings to bridges, and is actually the world’s second most consumed material (water is first). 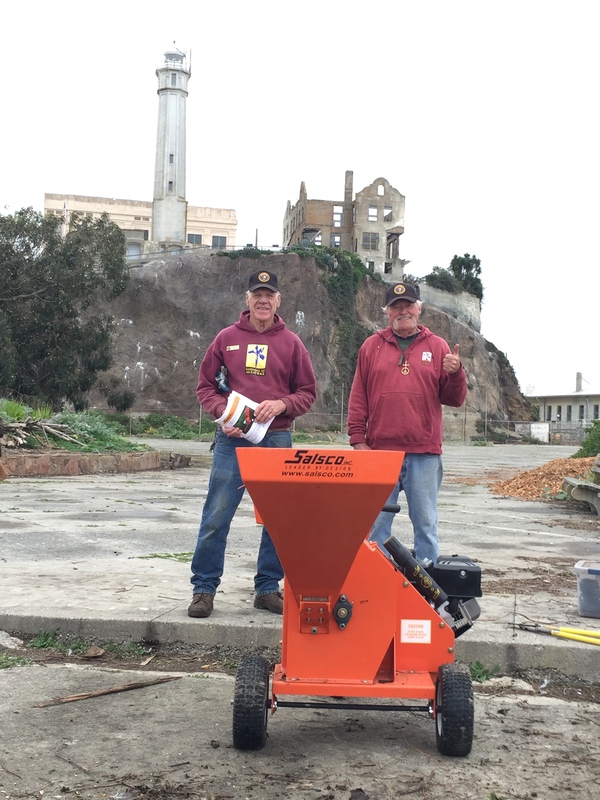 Fittingly, Alcatraz continues to play a part in the latest technology for concrete with the Concrete Preservation Institute. 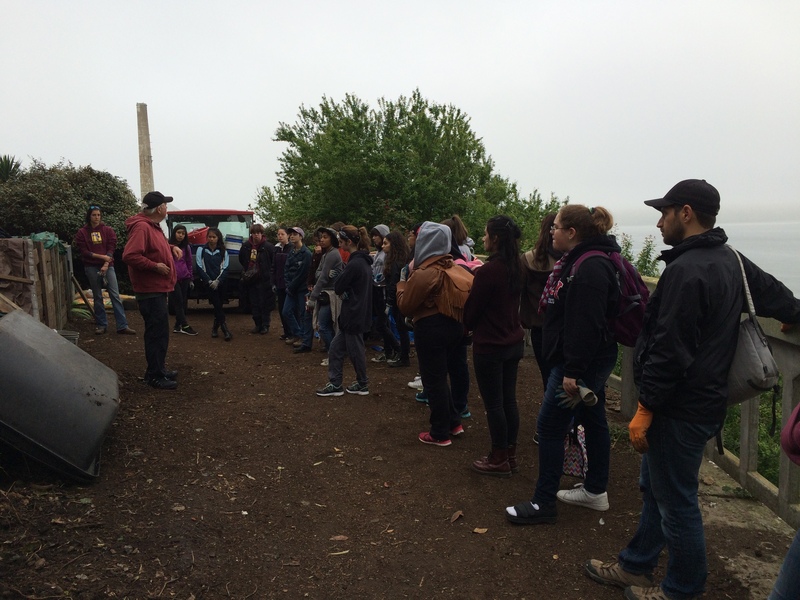 A National Park Service Partnership began with a school program based out of Chico State University for students in Concrete Studies to have hands-on experience. 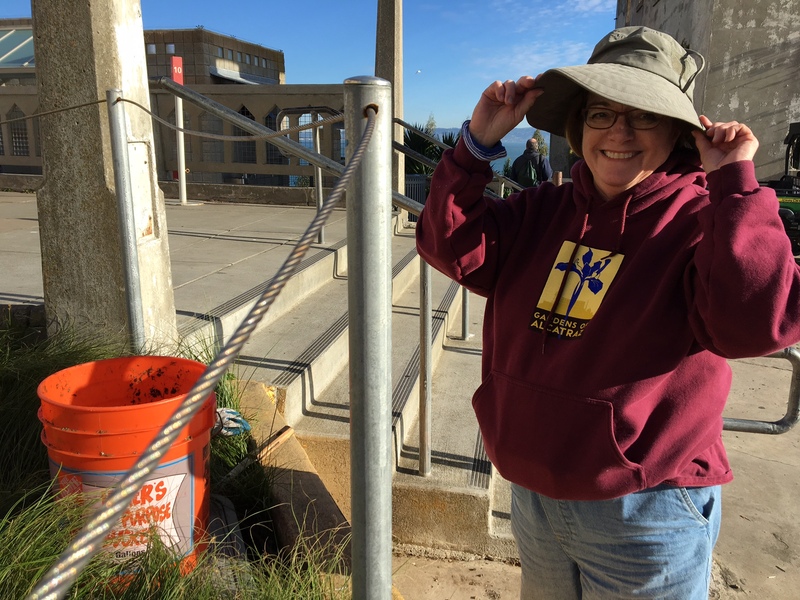 Alcatraz happens to be an island full of concrete that is weathering in the salty wind that offers endless projects to students. Summer 2015 Class. Photo courtesy of CPI. 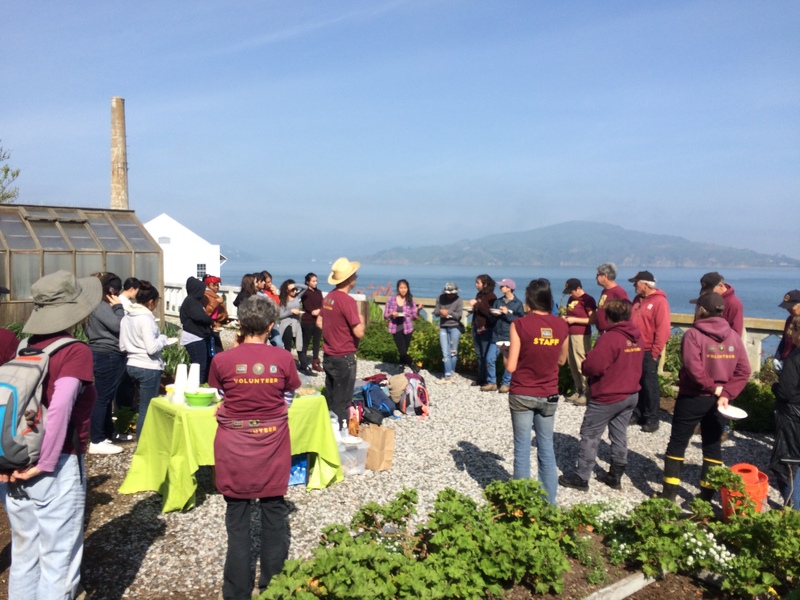 Much like the Alcatraz Historic Gardens Project, the Concrete Preservation Institute program quickly grew and, as of 2015, is now its own separate ‘non-profit educational foundation that advances the industry and partners with the US National Park Service at Alcatraz Island to preserve landmark structures’. 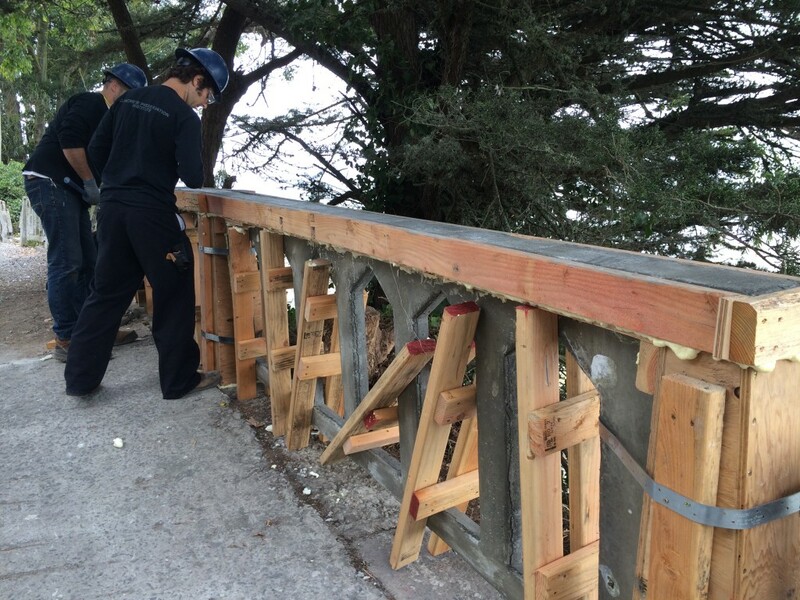 Personally knowing very little about concrete, other than it is strong, I wanted to know more about how the students worked their magic of transforming deteriorating railings back into new. Catrina, a current student of the program, and Scott, one of the programs leaders were generous with their time to answer my questions. 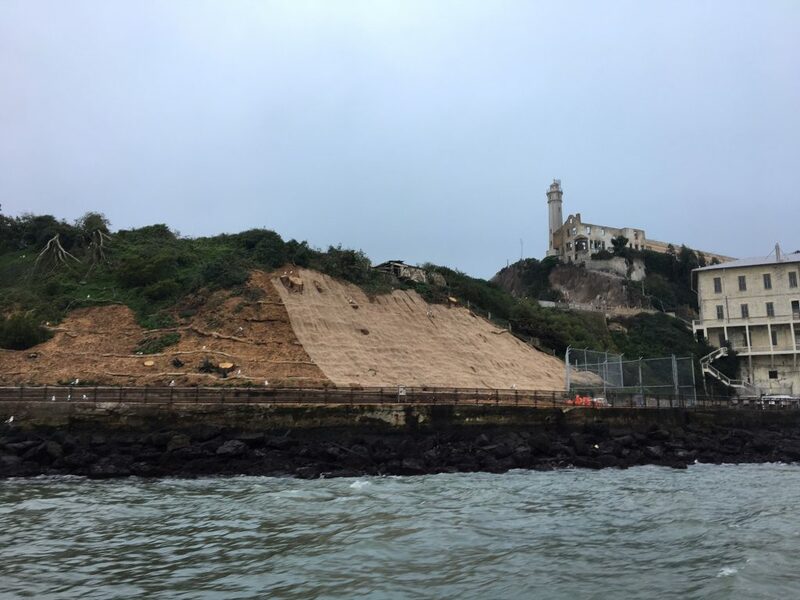 The concrete preservation projects the team works on are decided by a Projects and Stewardship committee of staff from the National Park Service, the Golden Gate National Parks Conservancy and the CPI team themselves. As the program continues, the student’s projects are getting more complicated and more skilled. However, the gardens offer a fairly straightforward project with the many concrete panel railings in the Rose Terrace and Officers’ Row. 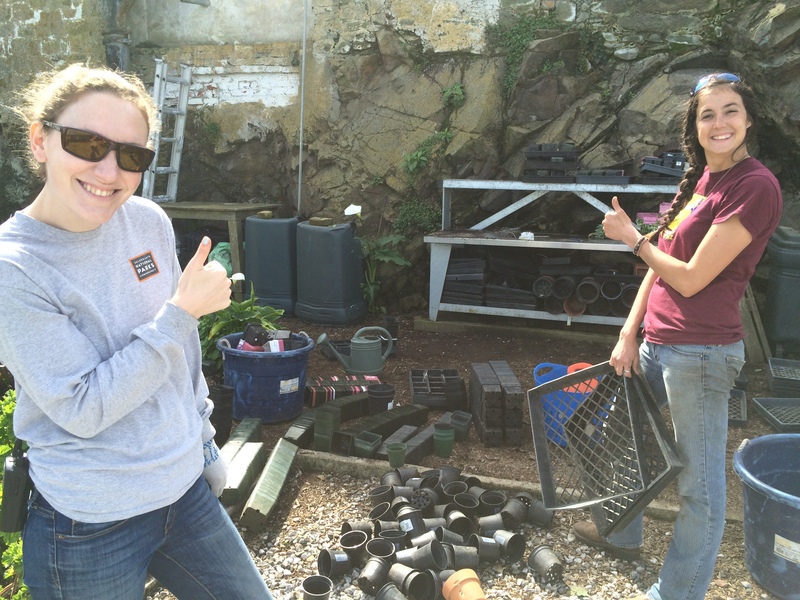 For each project, students learn project management and hands on training doing the work. For management, students run the project and comply with NPS protocols such as providing an existing conditions report, historical report and taking in progress photos to document the work. The hands on training involves drawing the railings to scale in blueprints, building the forms and learning how to work with the various materials with safety as a priority. In her own words, Catrina is embracing CPI for what it is; a once in a lifetime opportunity to be a part of becoming an asset to history. “I am learning so much here. Other internship would be all paperwork and no application of skills. This is what makes CPI different. We learn from instructors who have dedicated their lives to the concrete Industry”. The students frequently receive visits from people who literally write the textbooks students use in concrete engineering majors! Q: Can you tell me a bit about the program itself? A: CPI is a twelve weeks program open for college students and post nine eleven veterans. There are 3 sessions per year. 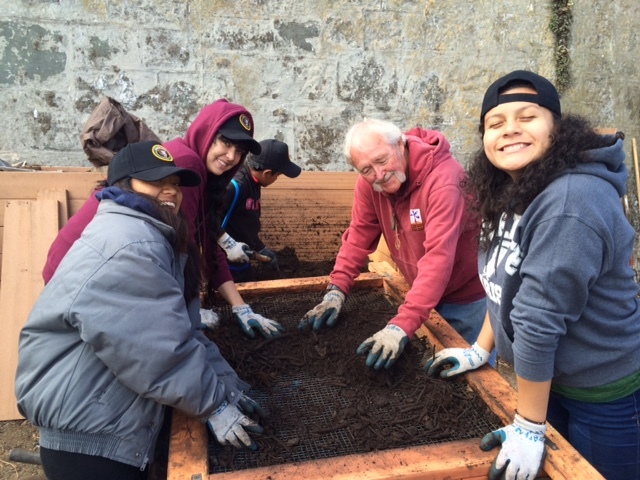 CPI teaches students research & technology innovation, tool knowledge and application skills, importance of industry job site safety, and using skills to apply to preservation of Alcatraz. 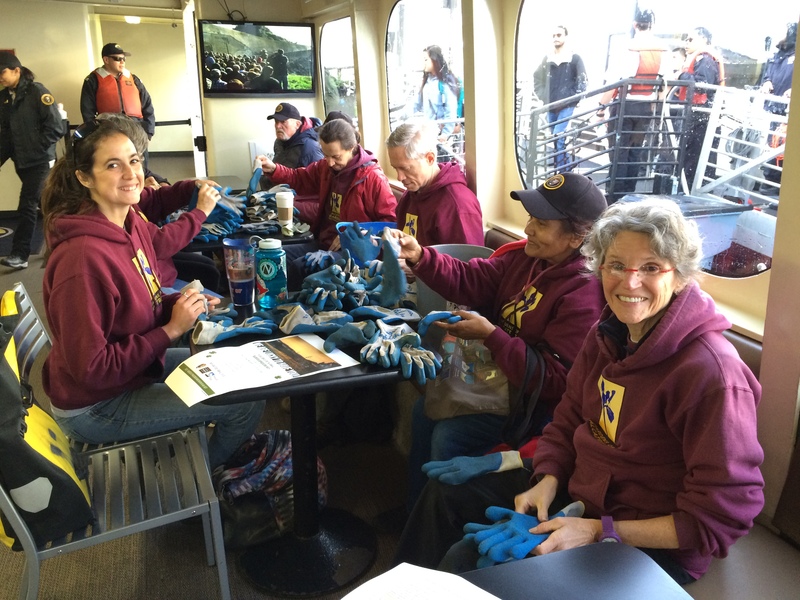 There are people from many different educational backgrounds in this program. Some participants educational background range from construction industry management, civil engineering, biology, megatronics engineering, and architecture. Several people involved are both in schools and active duty servicemen and vets who served in Iraq. Veterans are always urged to join CPI program. I believe this program is an amazing opportunity for anyone who is involved. Q: What makes the concrete you are using now special? A: The concrete we are using is manufactured by BASF to add extra features to withstand the elements which typically limit the longevity of concrete. 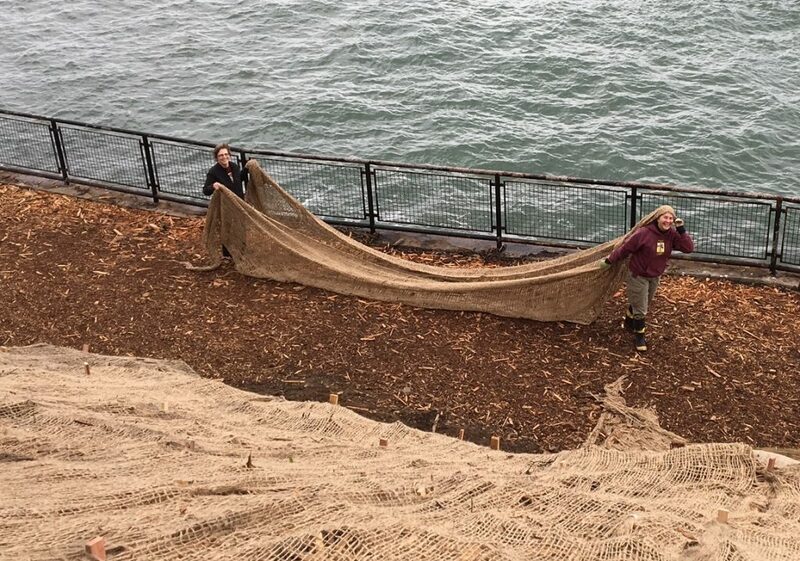 We mixed fibers in the mix for the panels of the railing because those areas are subjects to a greater weight load because of the top portion of railings. The panels are only 2″ in thickness so the panels have stainless steel threaded rods (the new rebar) embedded in them. Cracking over time is natural process in concrete because the rebar corrodes. The synthetic fibers never break down and so in theory, the concrete should last indefinitely. Catrina was initially informed about this opportunity from her program director at New Jersey Institute of Technology. The current session finished on August 21 program and she will have a greater advantage for applying for fellowships and scholarships. 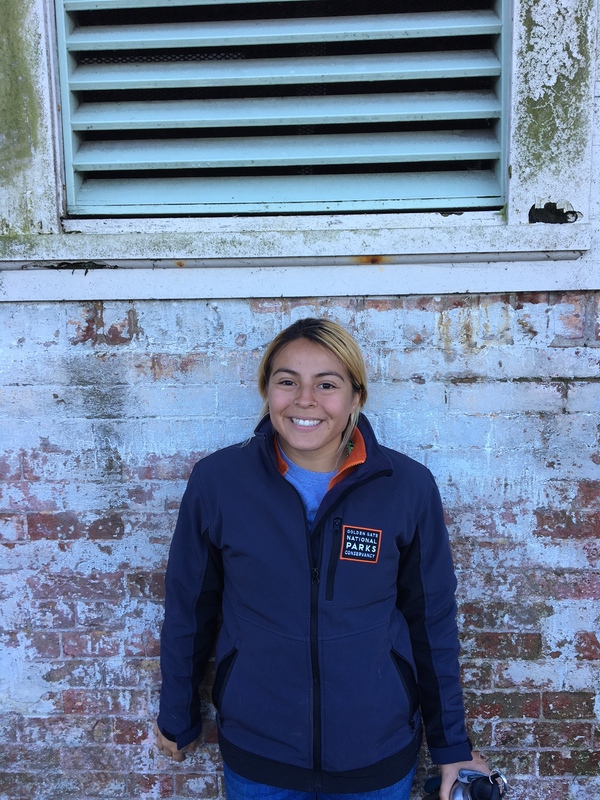 In the fall, Catrina will continue her schooling at New Jersey Institute of Technology for her engineering degree in concrete industry management and construction management. Her future is bright with limitless possibilities. With the abundance of concrete in the world, skilled people will be very much in demand to care for aging structures. Students will either go directly into the industry after their internship or will return to school to study chemistry, biology or architecture.